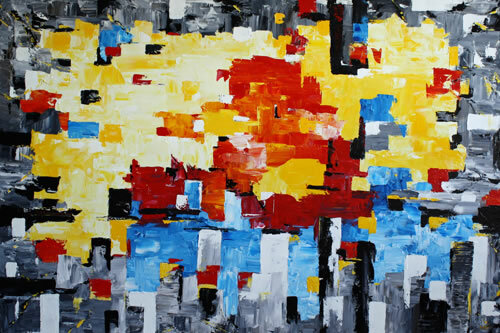 All Our Art at a Glance. 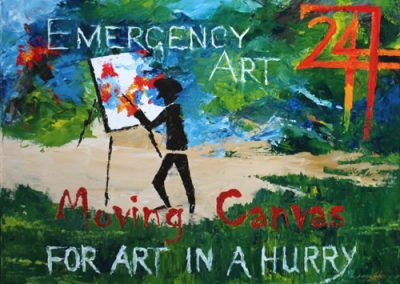 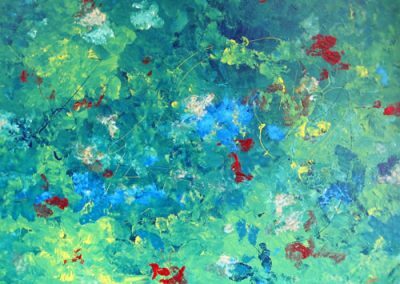 Scroll through to see all art available for rent and purchase, or click on the artist name. 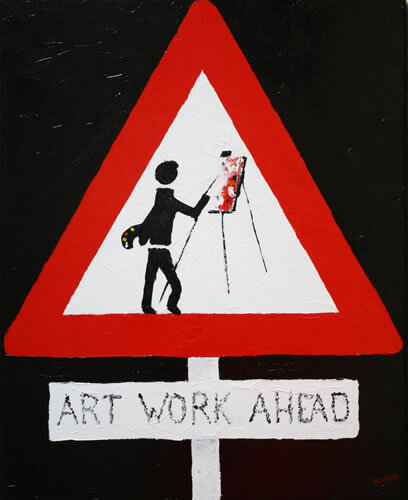 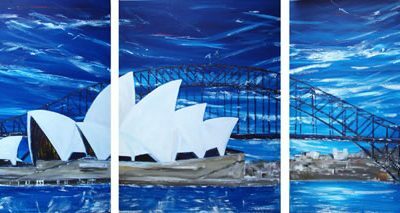 Please click Artwork or the Artwork section above for details EG sizes, rental prices and purchase prices. 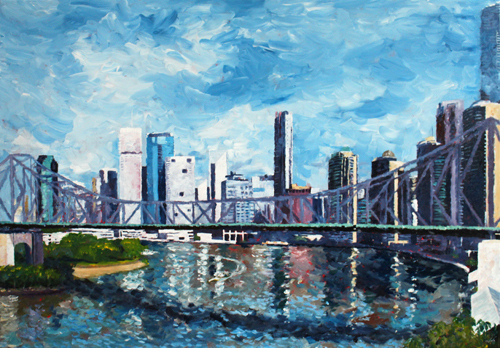 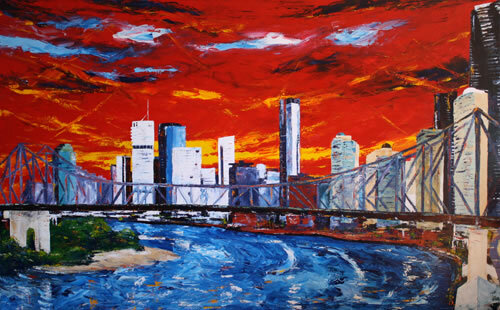 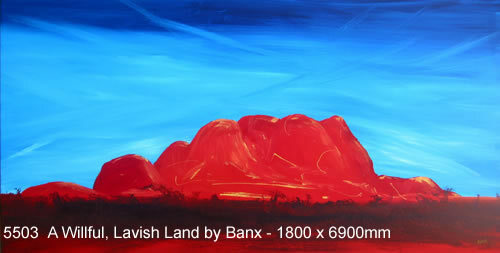 Banx also known as Mike Banks, is a Brisbane artist. 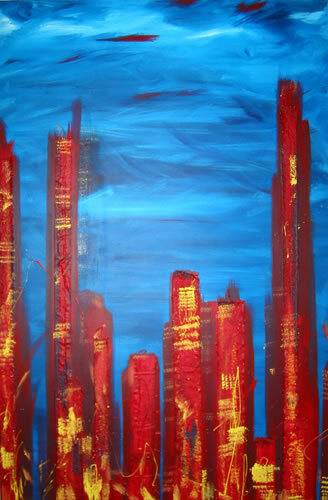 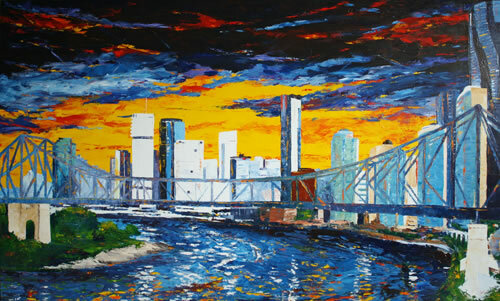 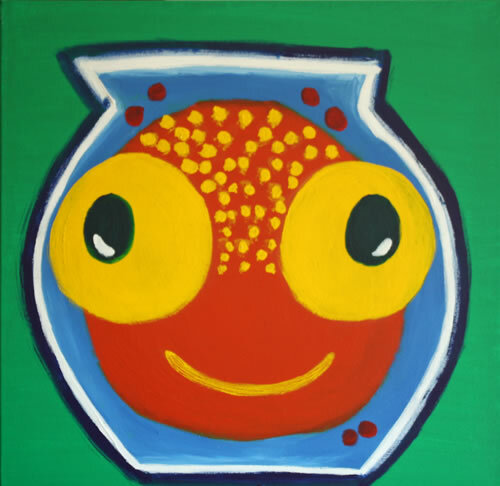 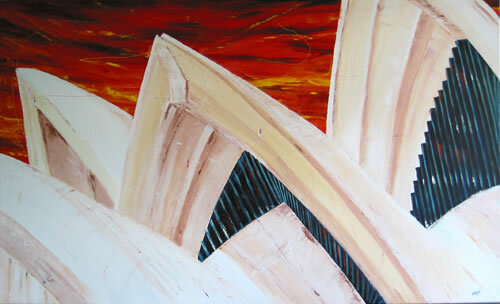 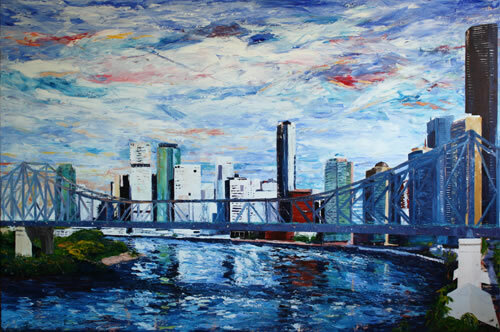 Mike offers contemporary original canvas art for rent ans sale for the office and home styling. 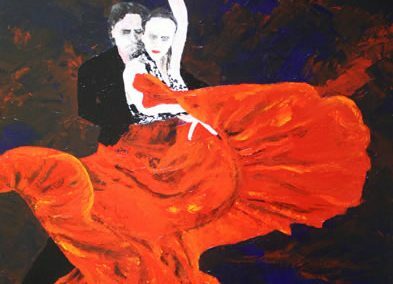 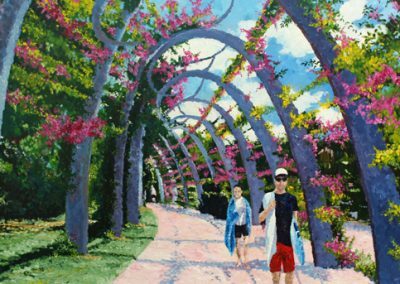 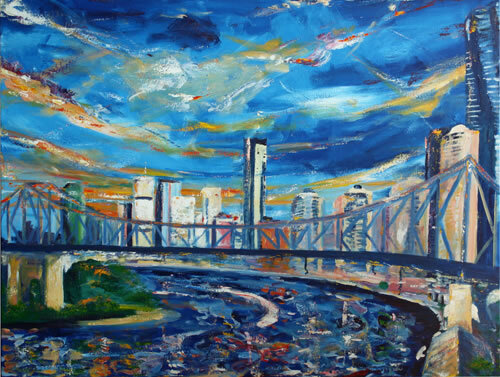 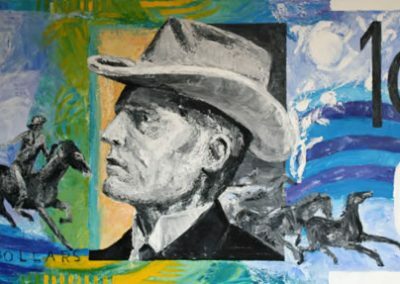 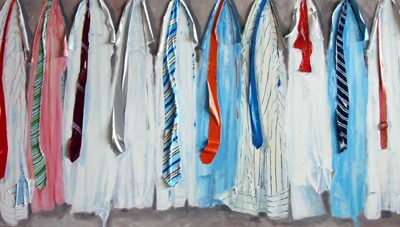 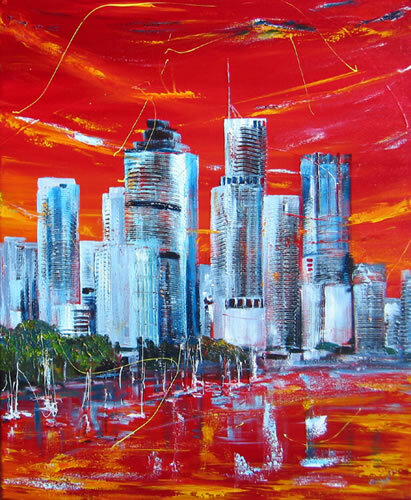 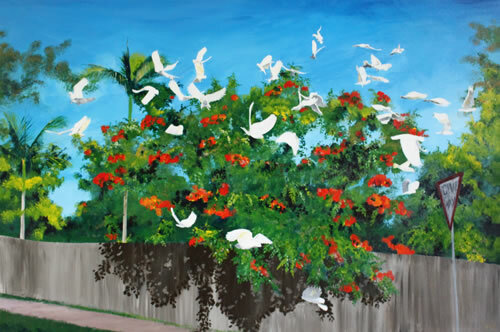 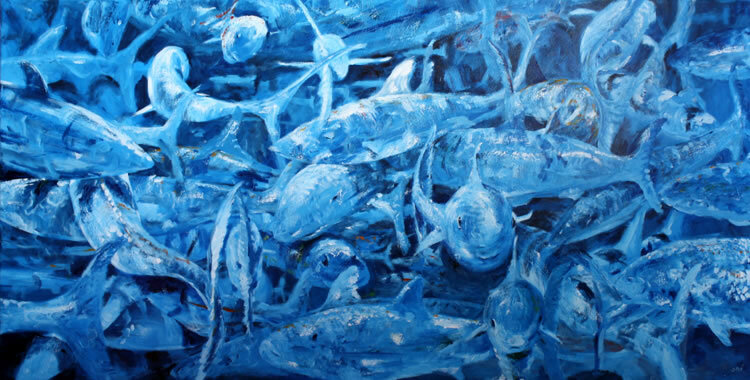 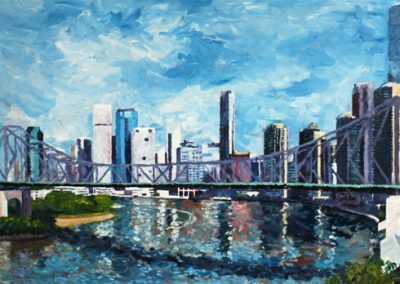 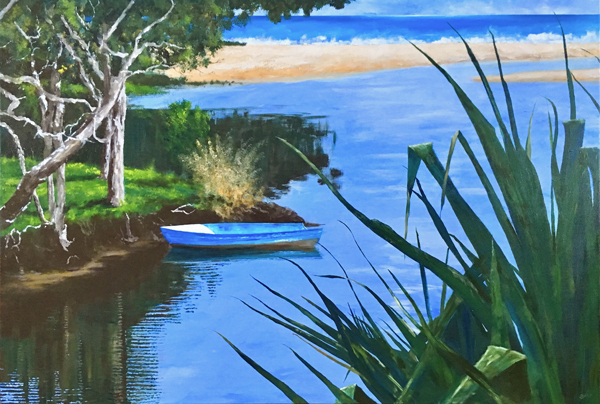 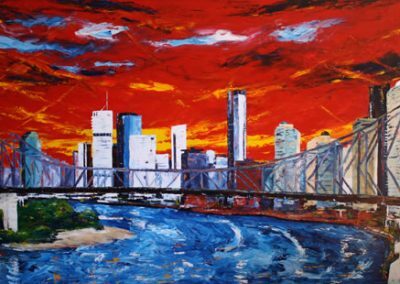 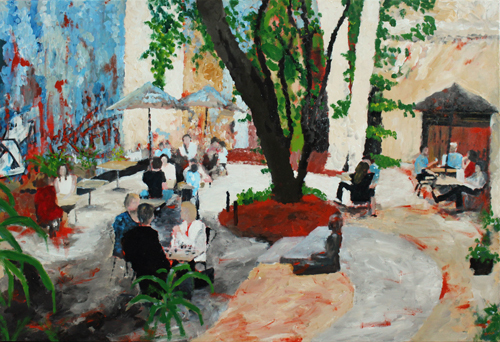 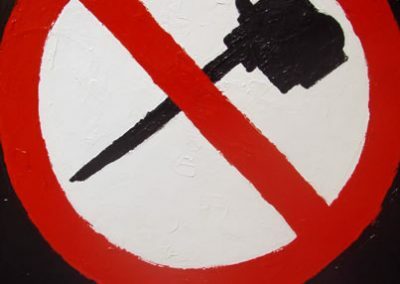 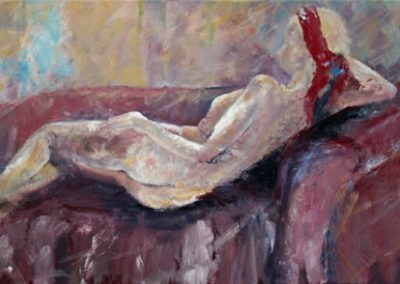 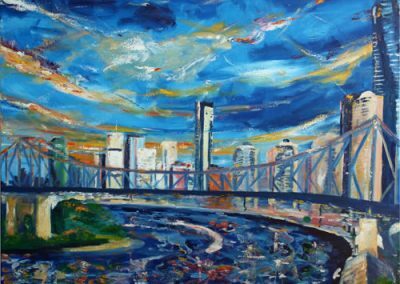 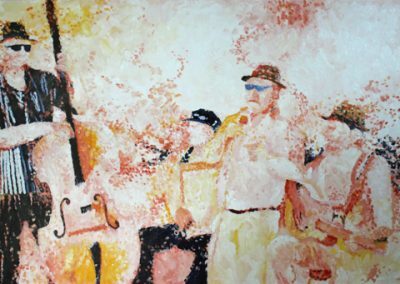 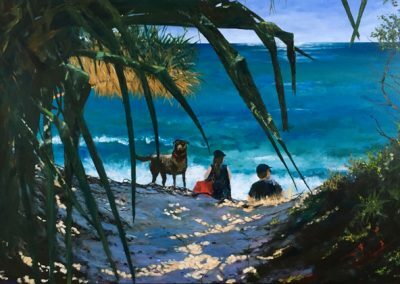 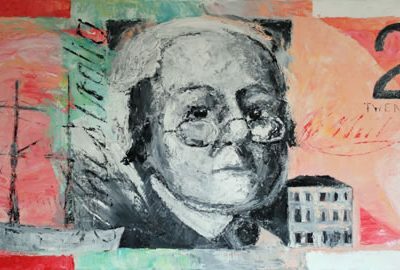 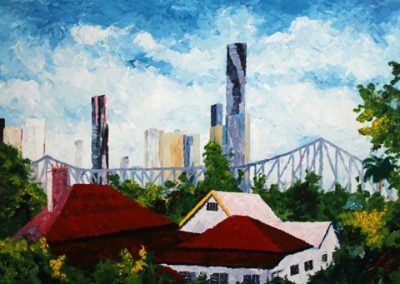 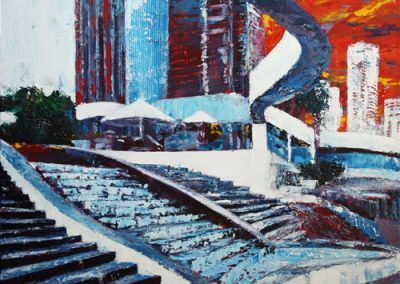 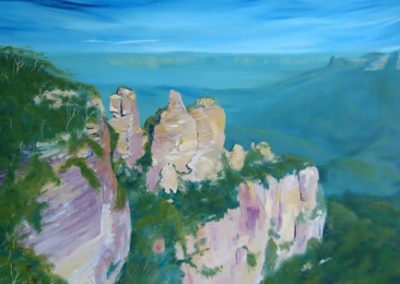 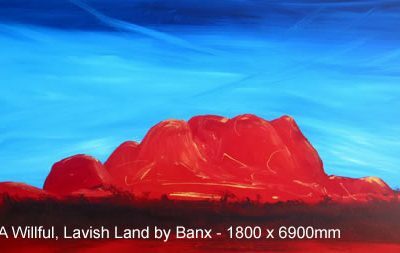 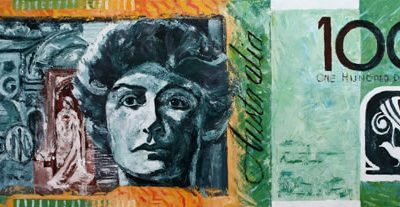 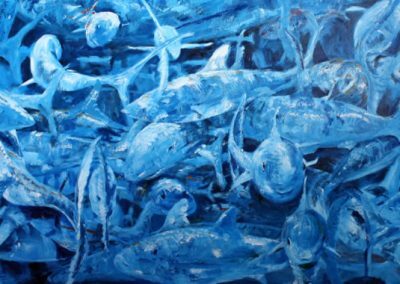 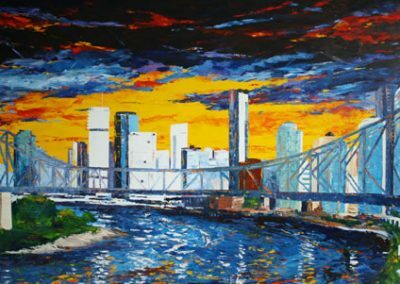 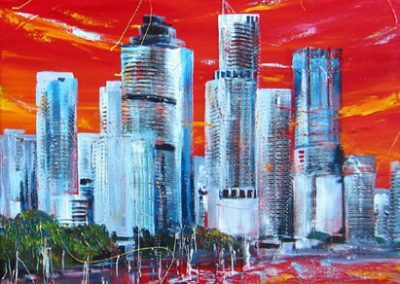 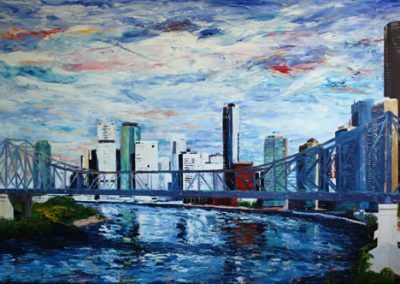 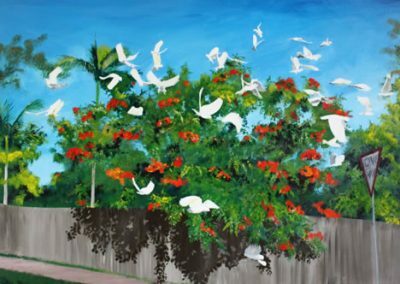 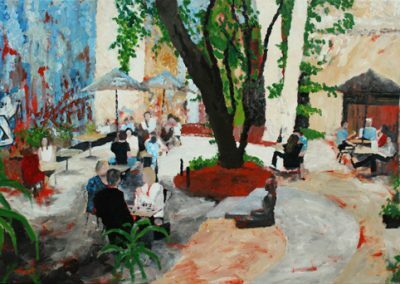 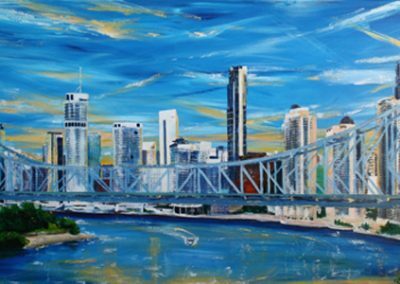 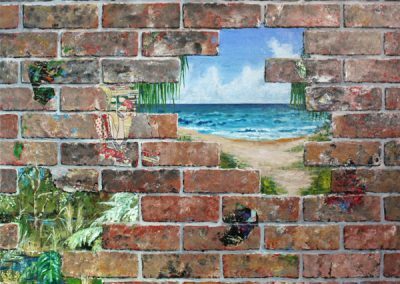 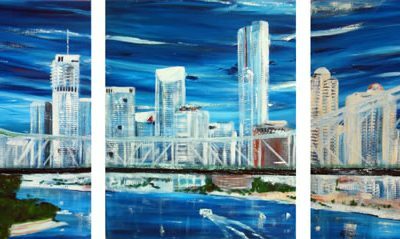 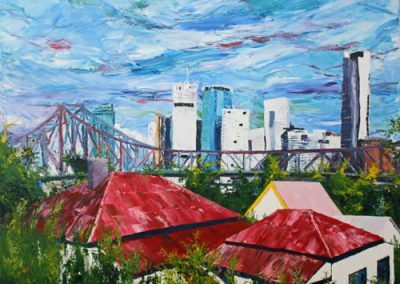 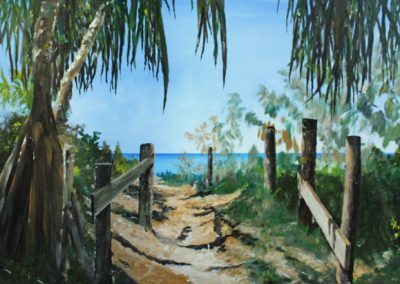 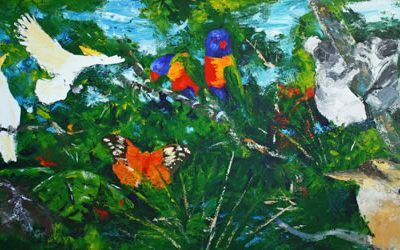 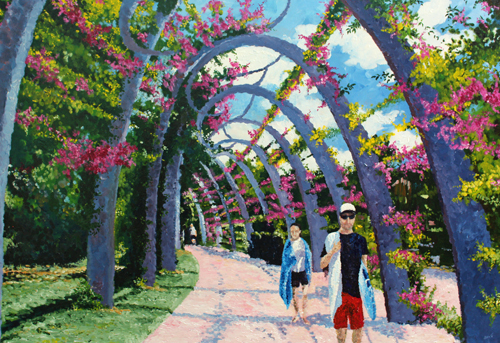 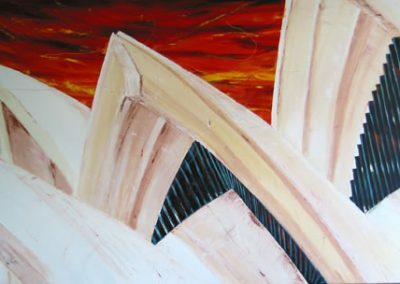 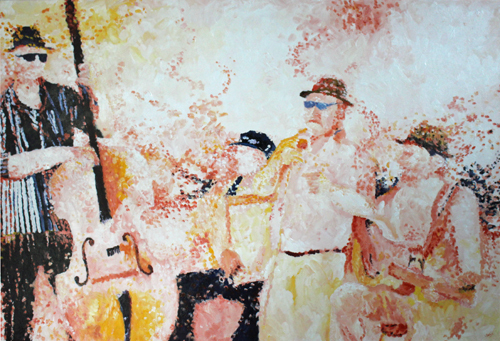 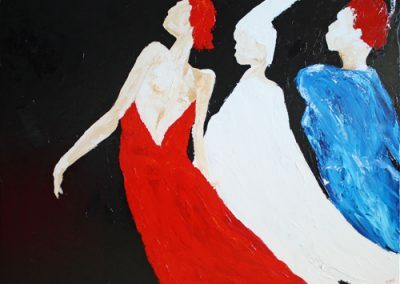 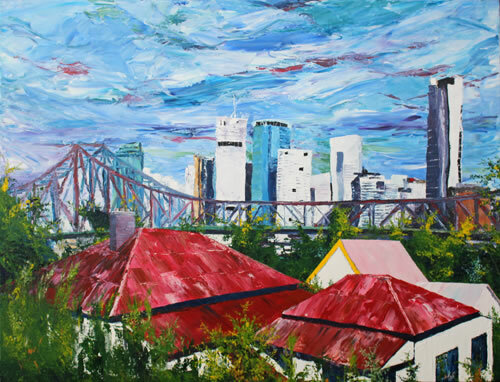 Banx exhibits annually in Brisbane and his many and varied works are held in private and public collections throughout Australia, New Zealand, USA and Europe. 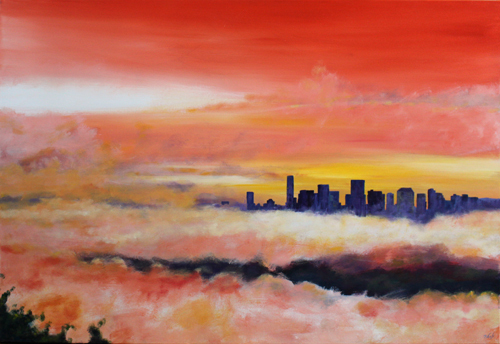 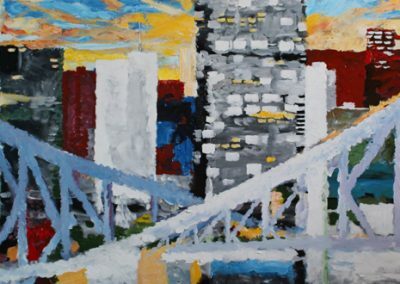 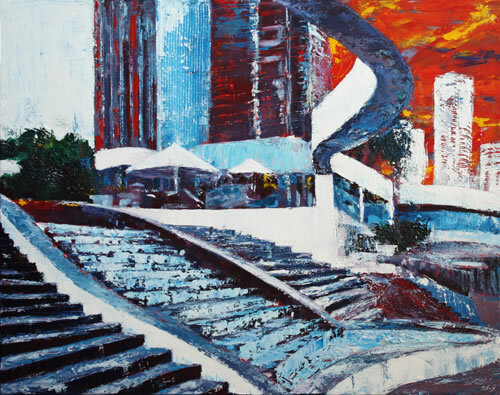 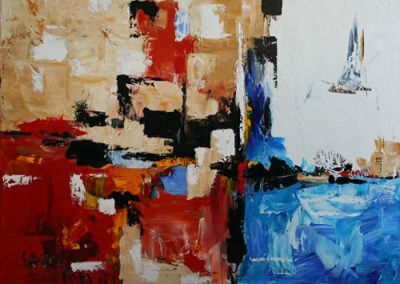 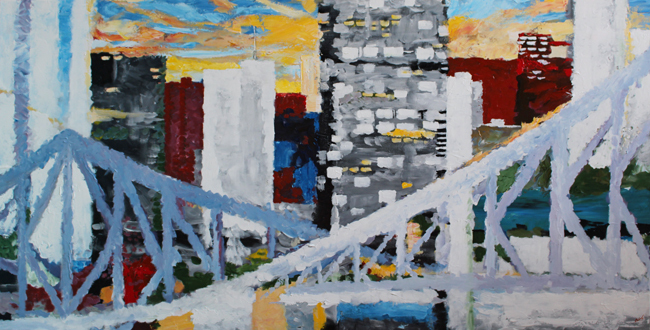 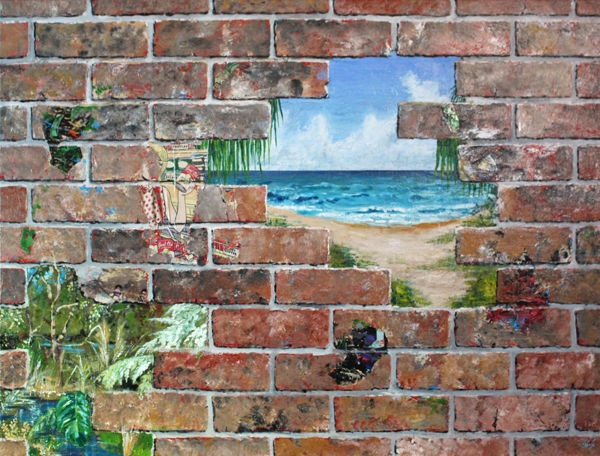 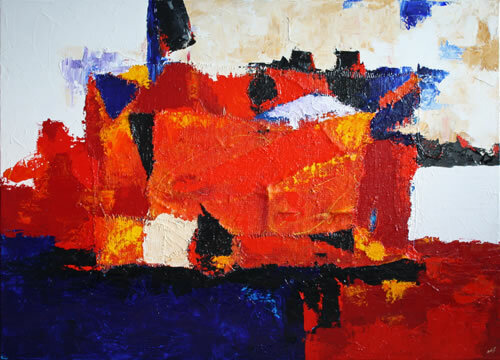 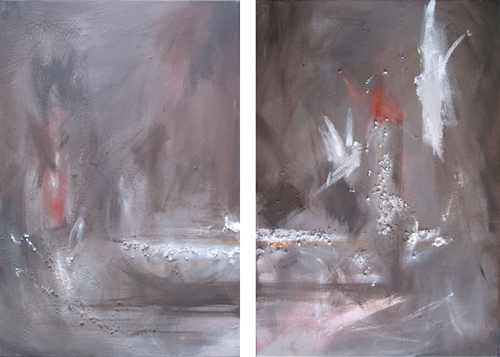 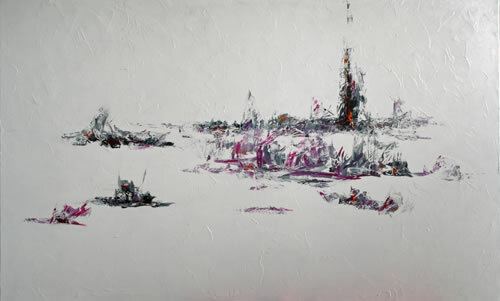 The city environment is a common subject in Luke’s work as it is as changing and unique as the people found within it. 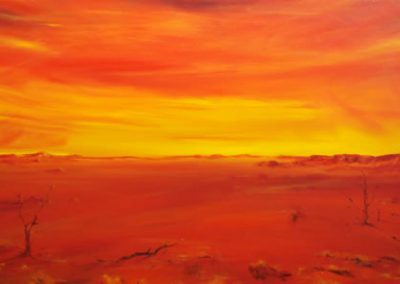 The added intrigue for Luke is to capture aspects of these environments that we can all relate to. 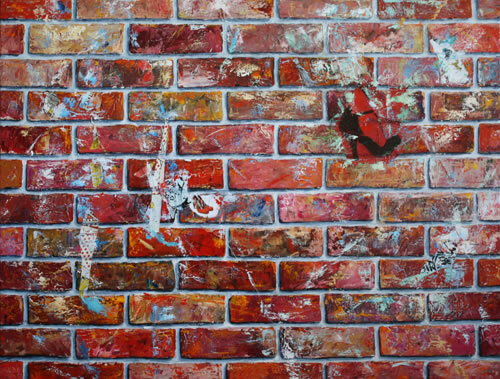 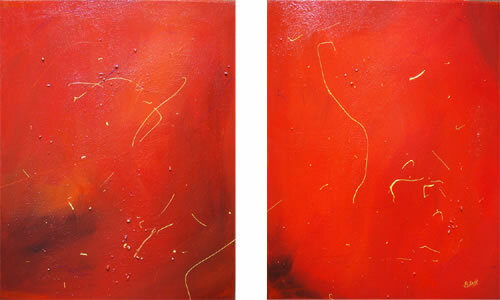 Leigh’s work has a direct relationship with my life and surroundings. 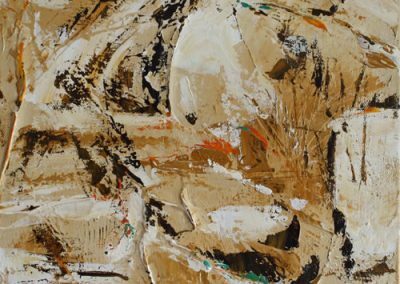 The work becomes a record, of layers of time and memory that have occurred not only while the space is under observation but through history. 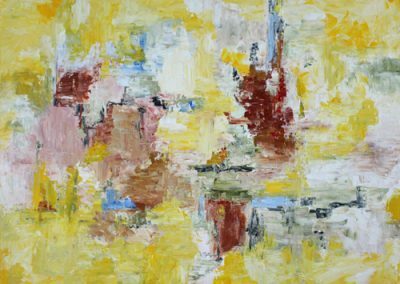 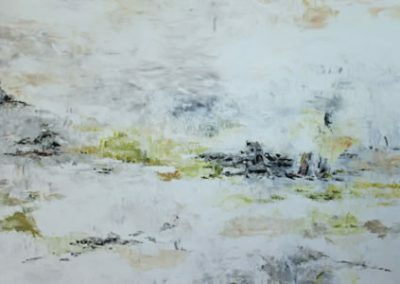 The layers of time and investigation become worked into the surface, describing/concealing, creating/destroying as the process and work develops. 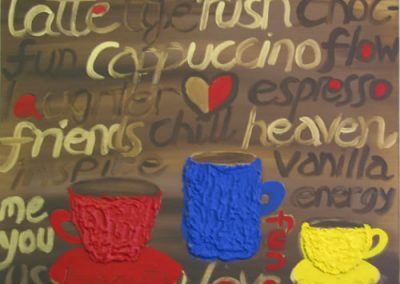 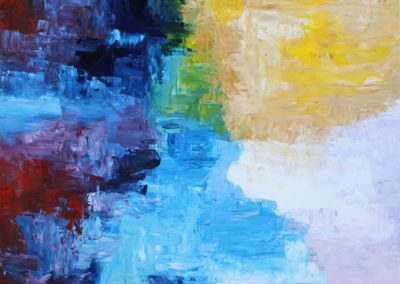 Maree sees colour as a source of inspiration through the emotions found in colour and the effect colour and tones have on people and can often alter a person’s mood or dealings with others. 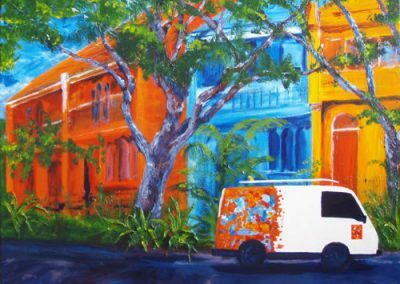 Kaye’s creative passion is contemporary colour, interiors and architecture. 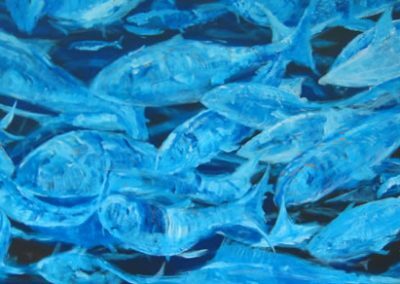 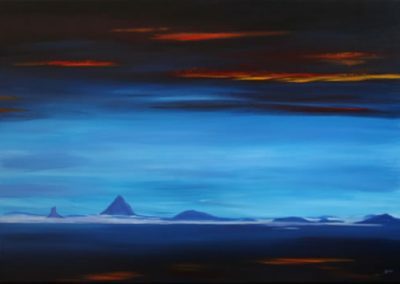 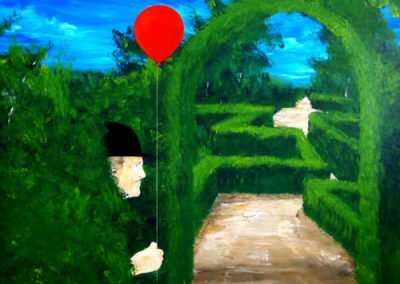 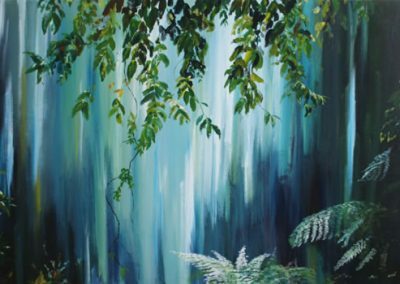 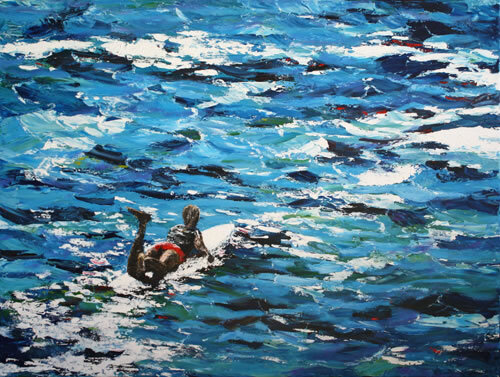 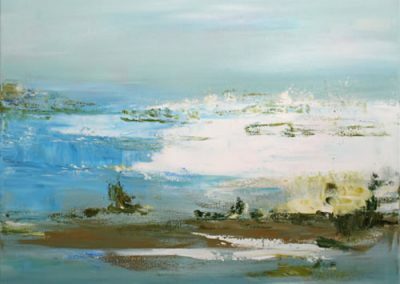 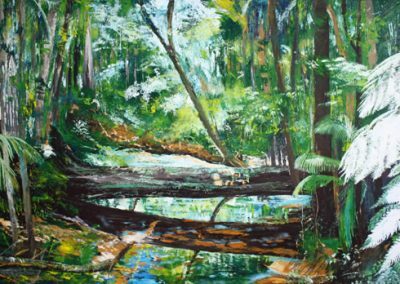 Kaye started painting in New Zealand when she owned and ran a small gallery in the Bay of Islands and enjoyed painting commissions for customers and cites travelling, both in Australia and overseas, as her greatest artistic inspiration. 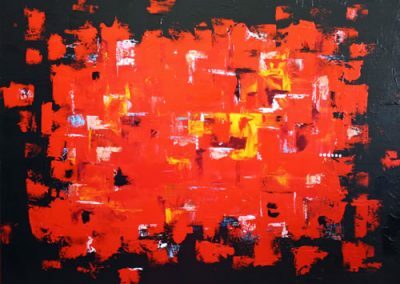 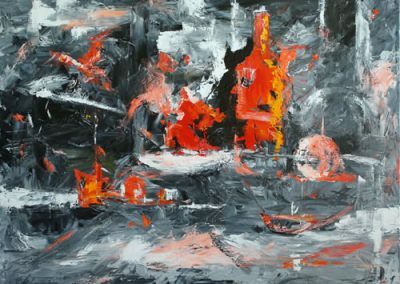 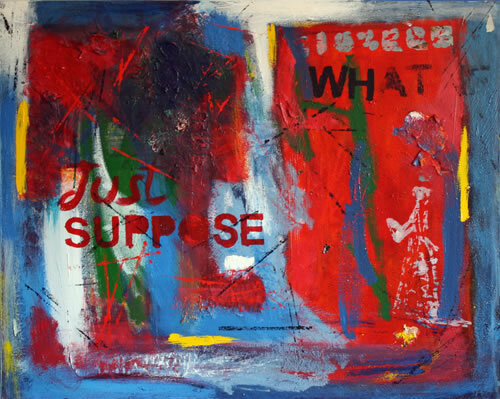 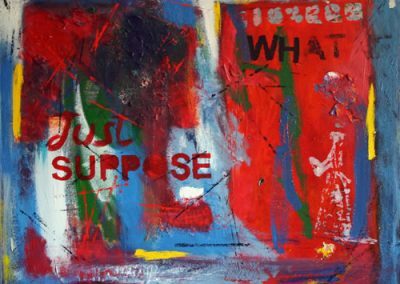 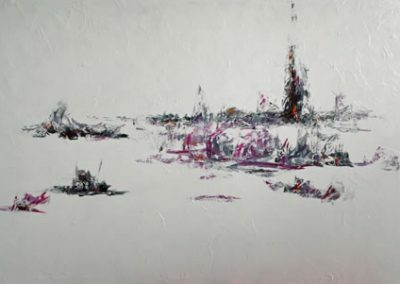 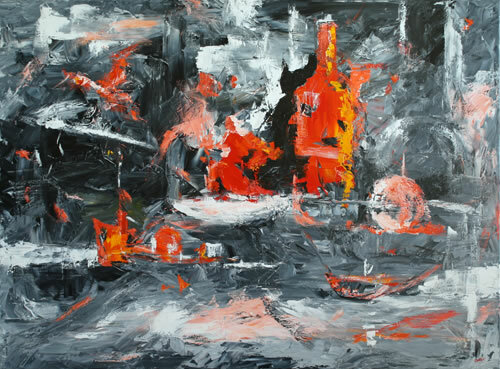 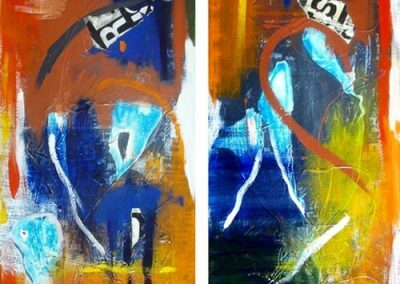 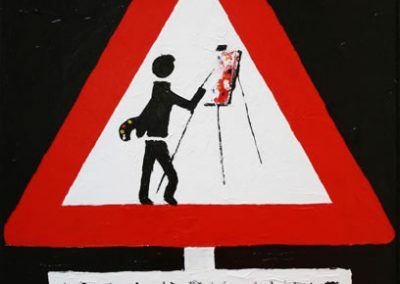 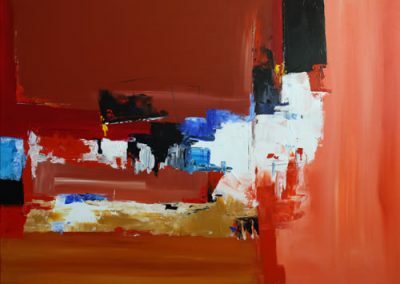 His style is loose and free, with large brush strokes and strong expressive mark making on canvas and board, anything he can lay his hands on really. 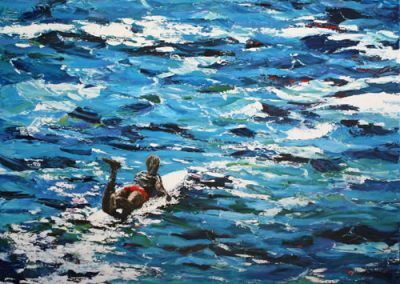 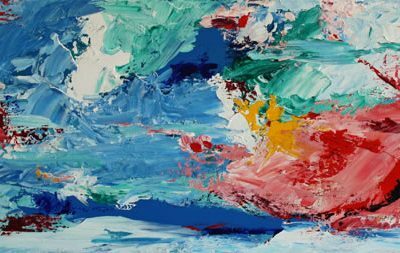 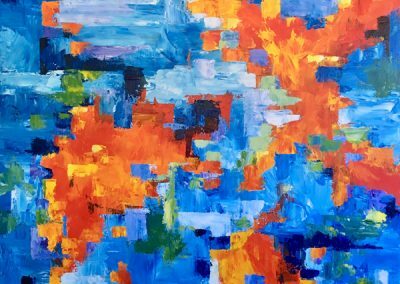 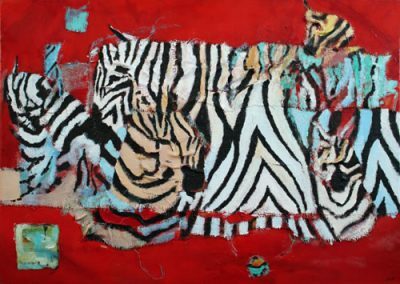 From life drawings to still life’s, through to colourful contemporary abstracts, Tony’s work creatively breaks through unchartered waters. 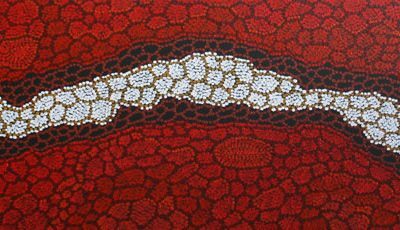 Kurun Warun is a member of the indigenous Guntijamara tribe and is a descendant from Truganini, the last Tasmanian indigenous queen. 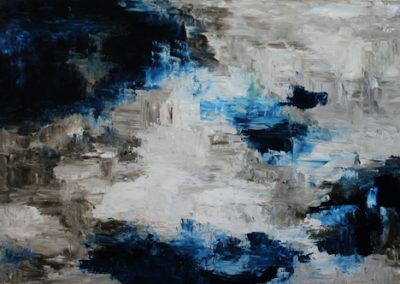 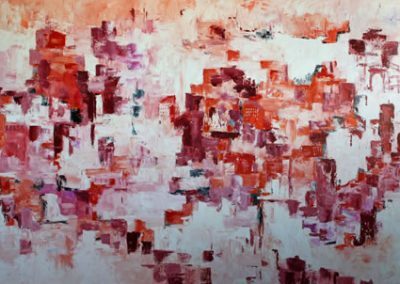 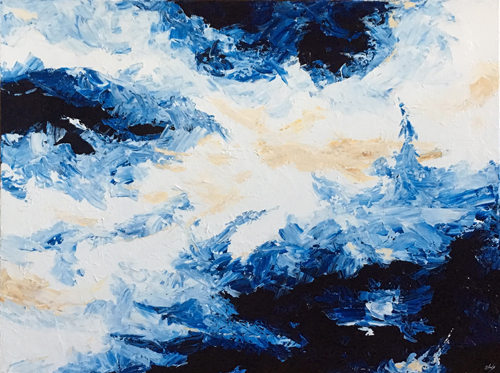 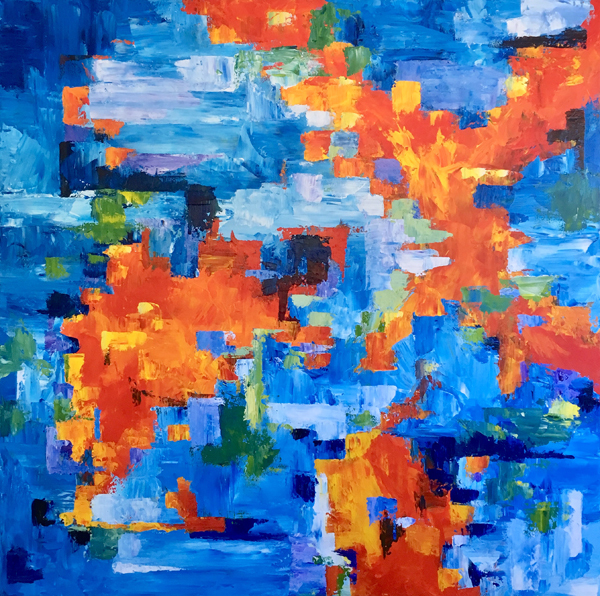 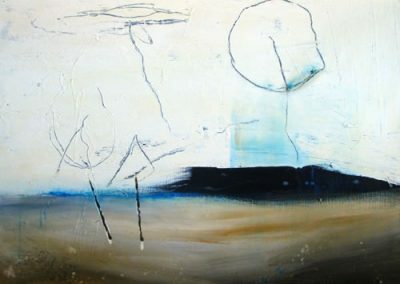 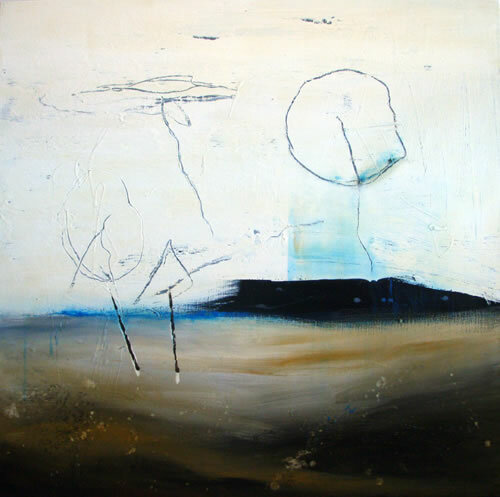 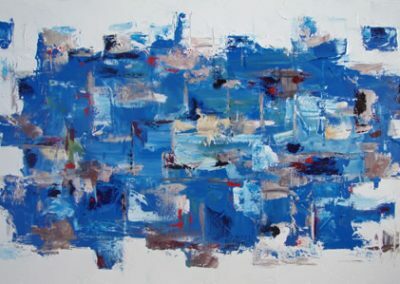 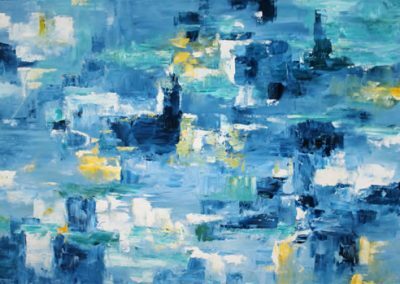 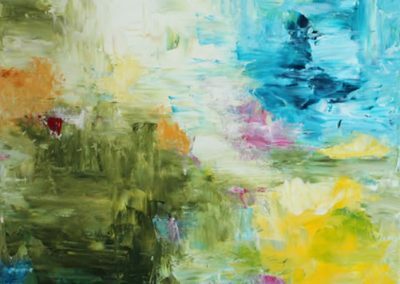 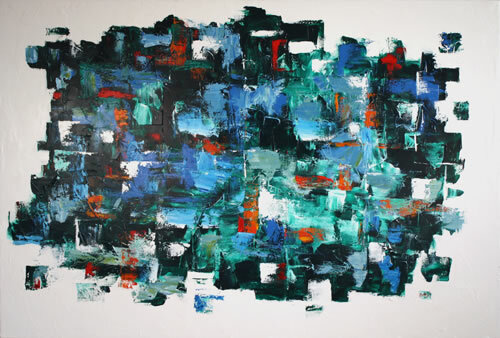 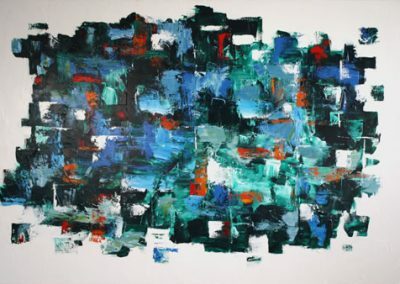 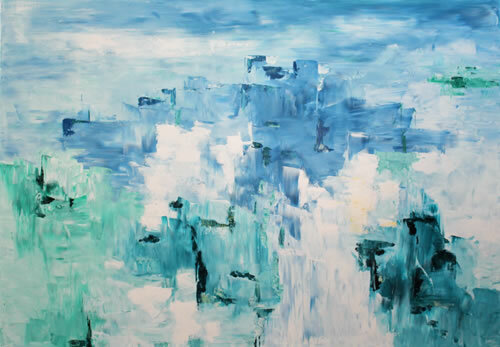 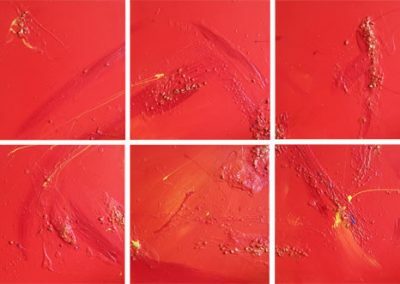 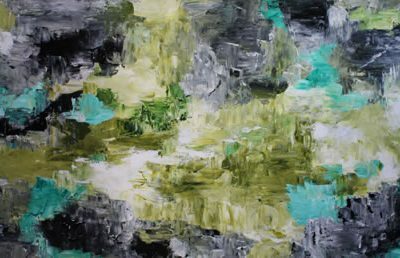 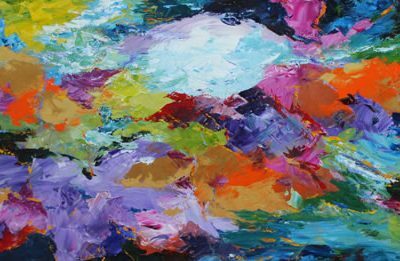 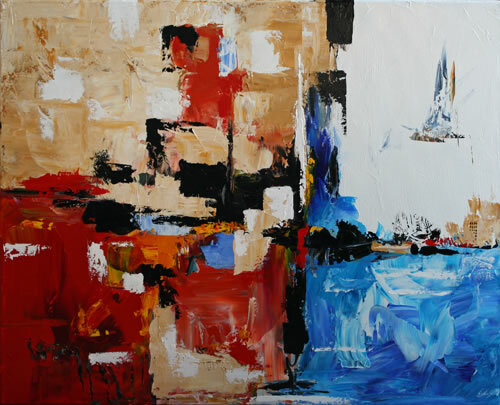 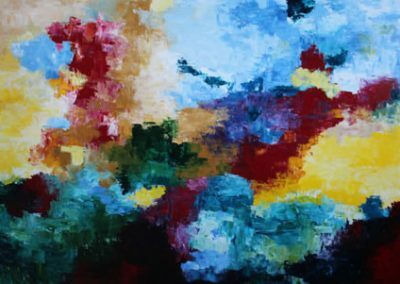 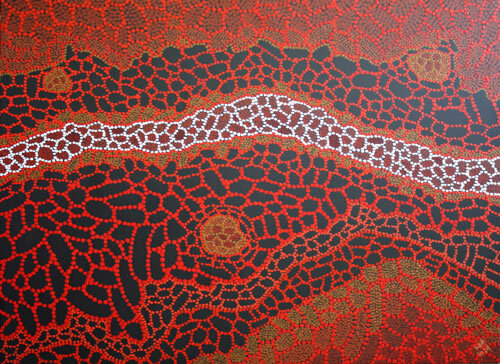 Sally Lehman is a Brisbane-based artist who brings a unique approach to her abstract paintings, resulting in a free, organic style that unfolds without constraint. 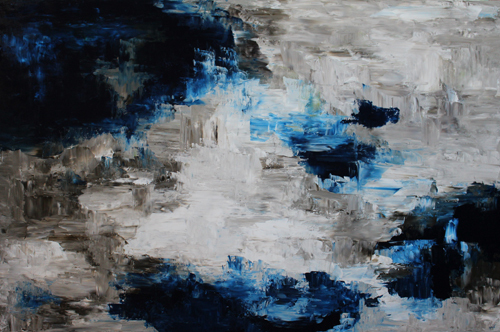 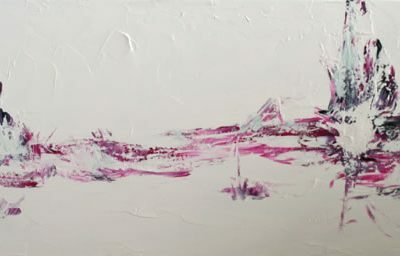 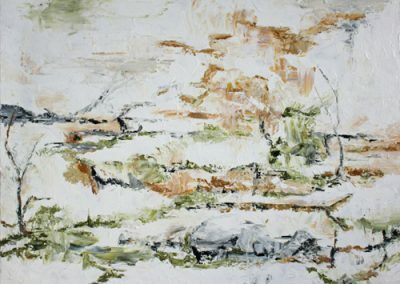 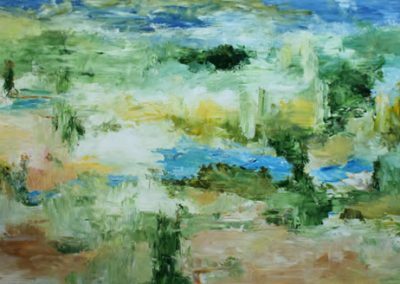 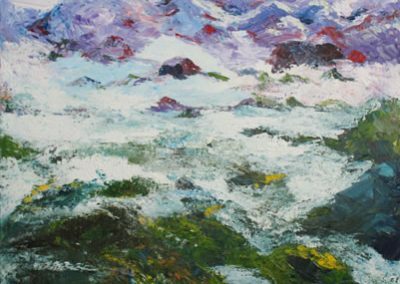 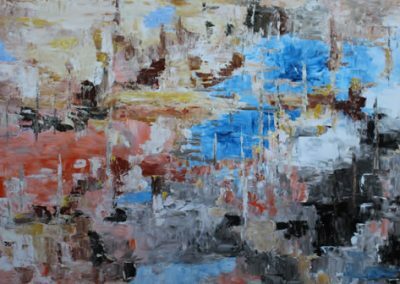 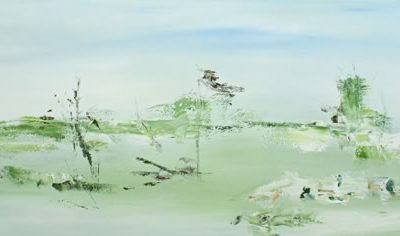 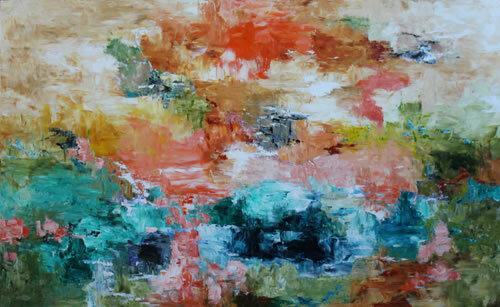 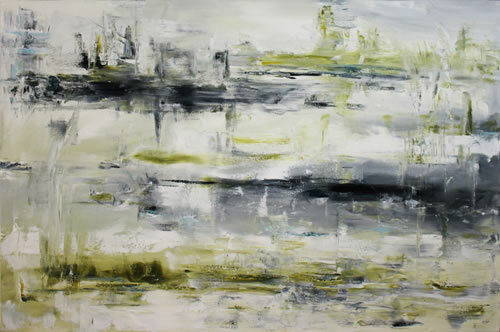 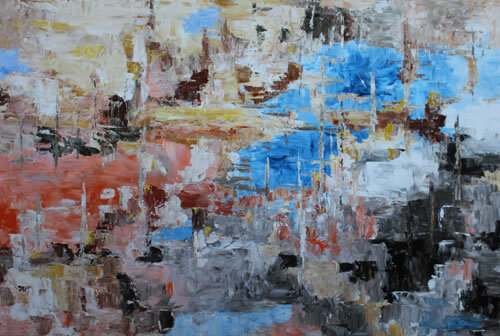 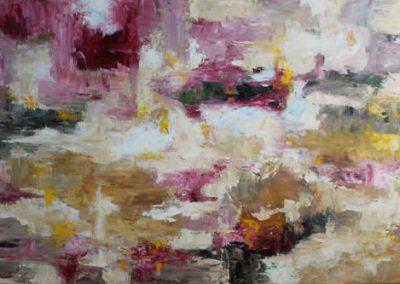 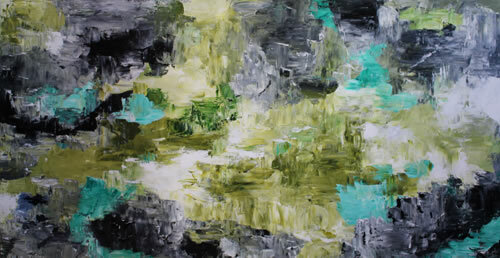 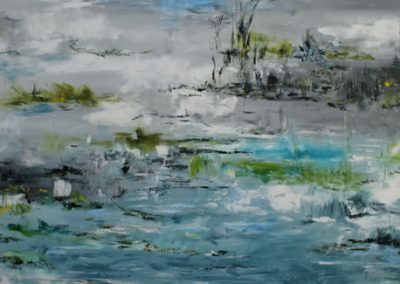 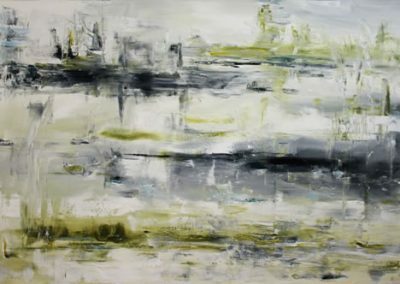 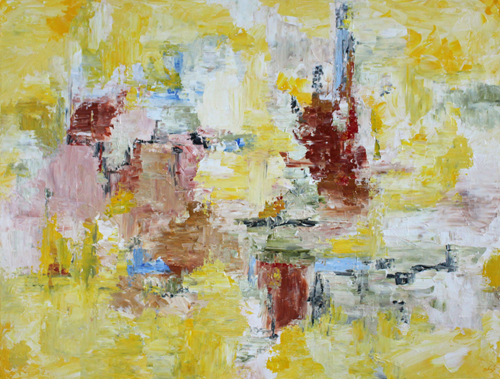 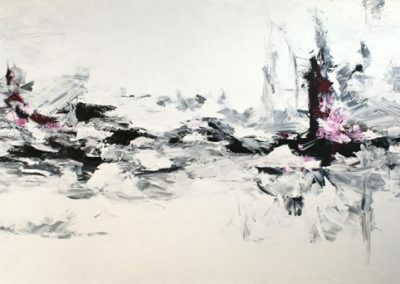 Julia’s paintings and drawings explore the relationship and connections between people and their landscape by overlapping visual imagery and textures. 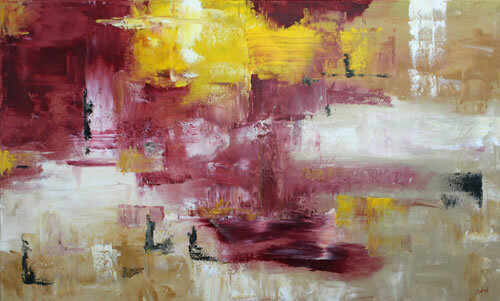 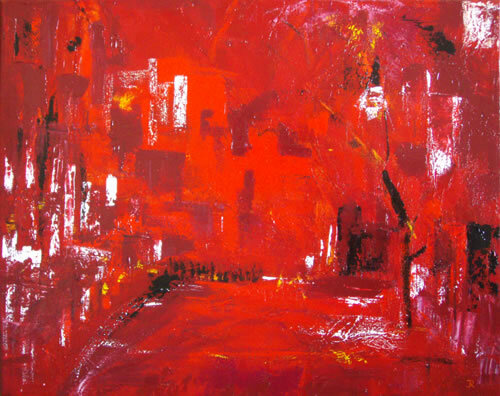 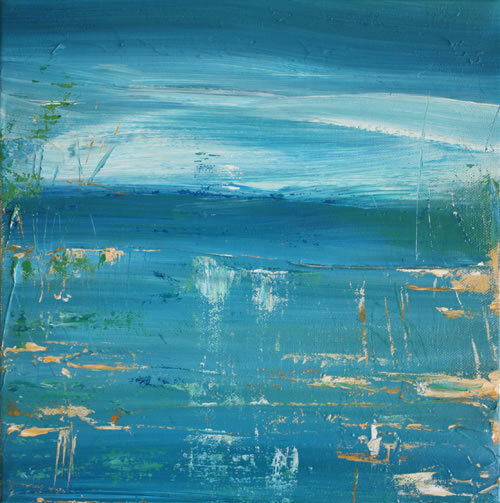 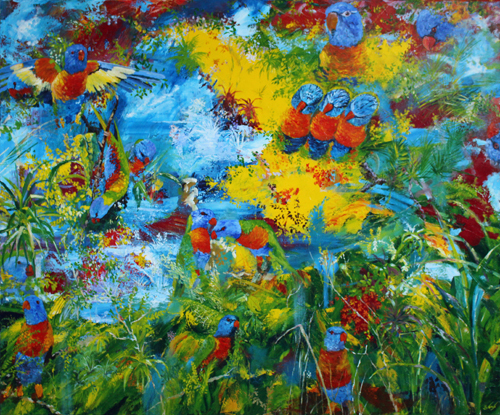 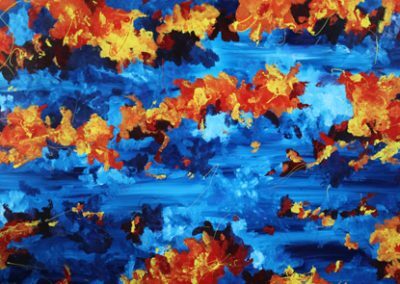 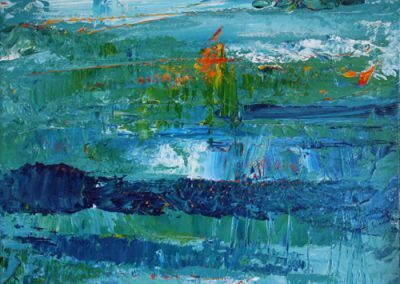 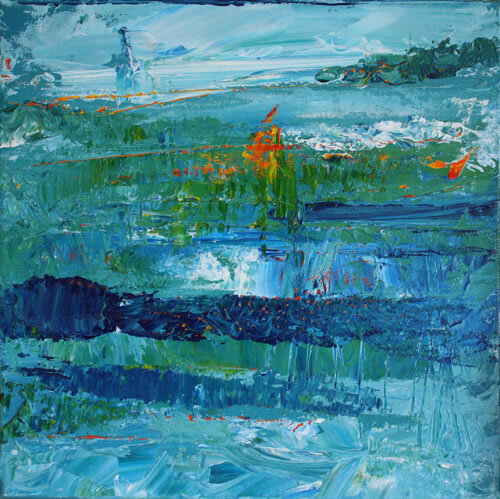 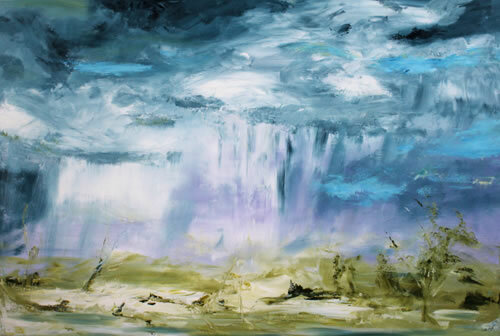 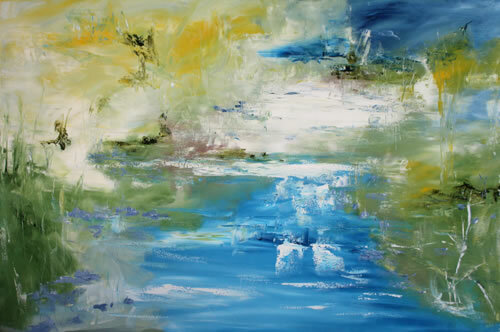 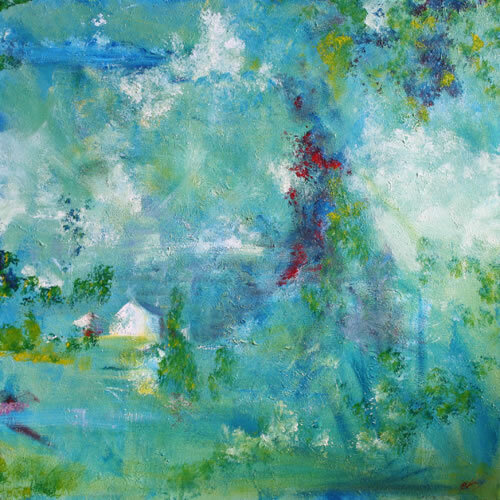 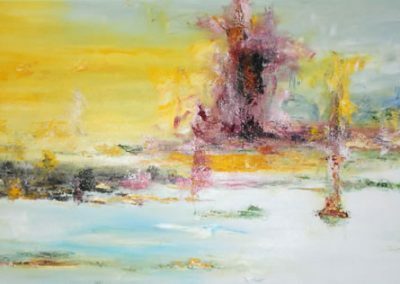 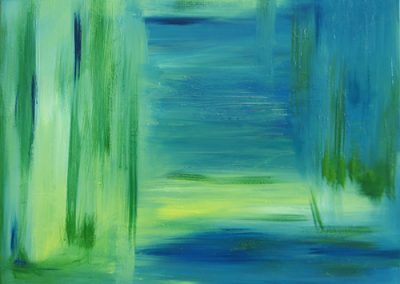 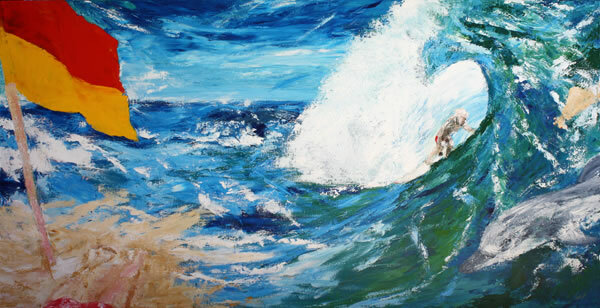 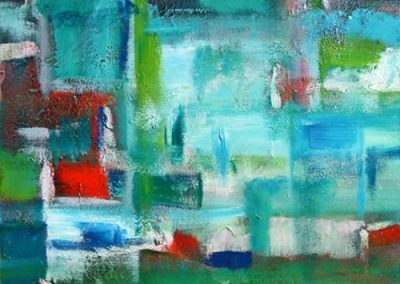 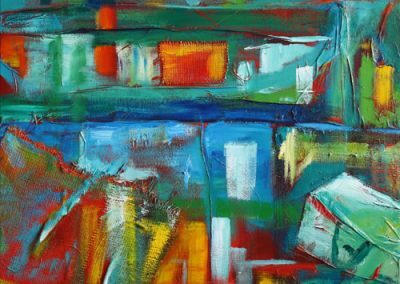 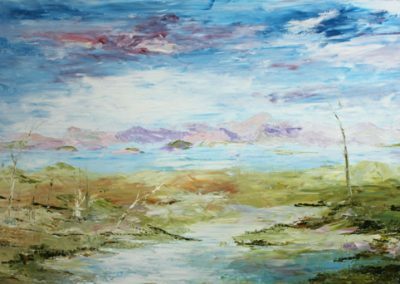 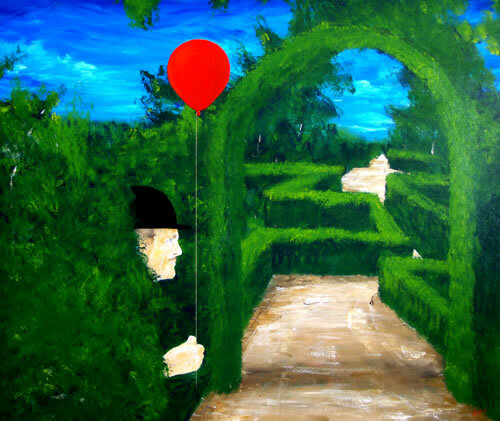 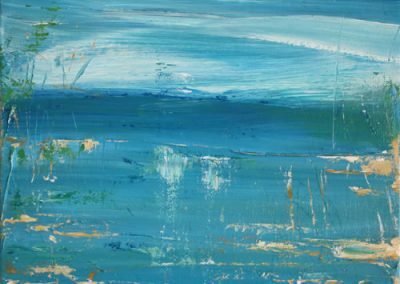 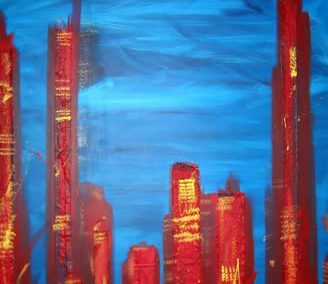 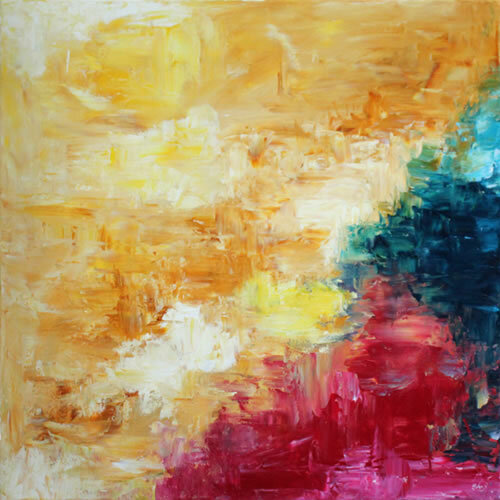 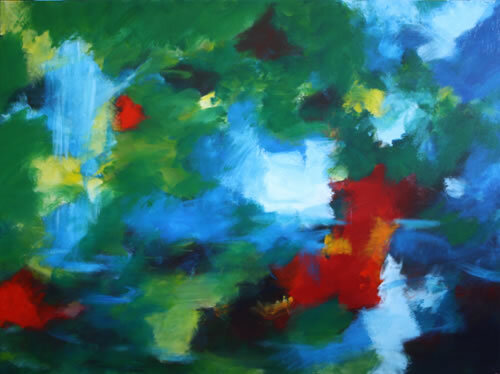 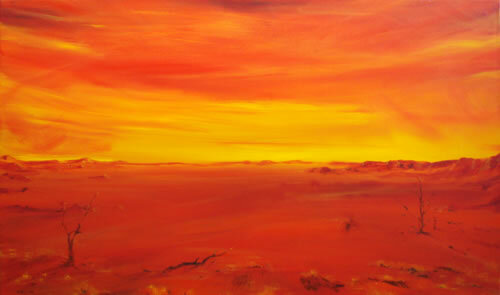 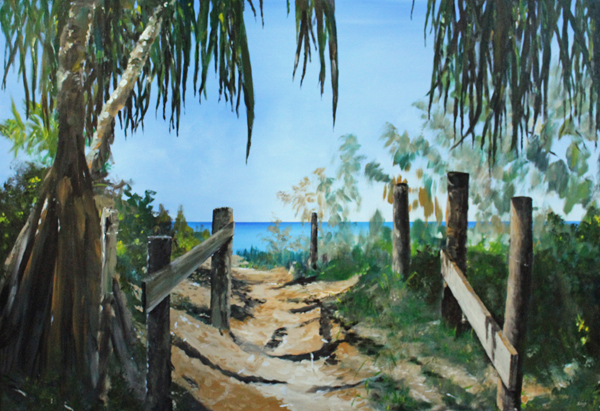 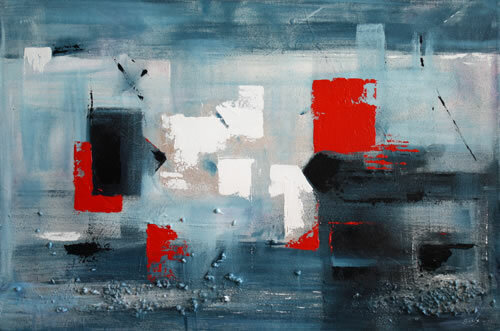 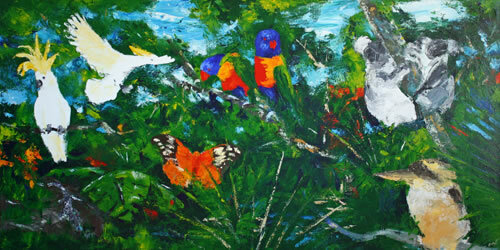 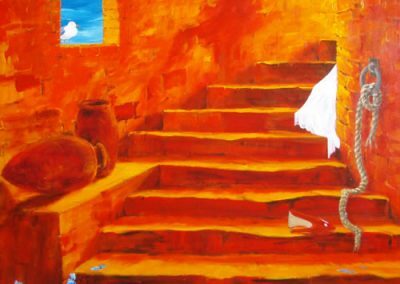 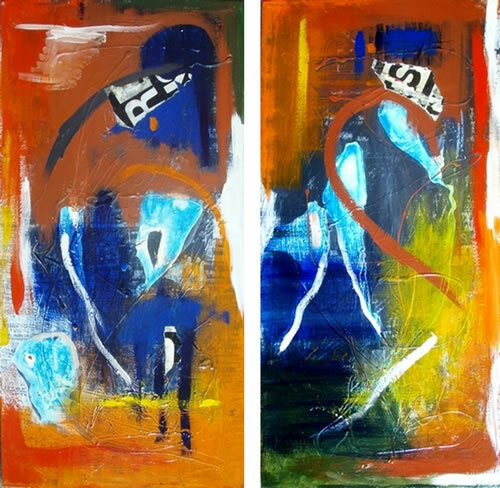 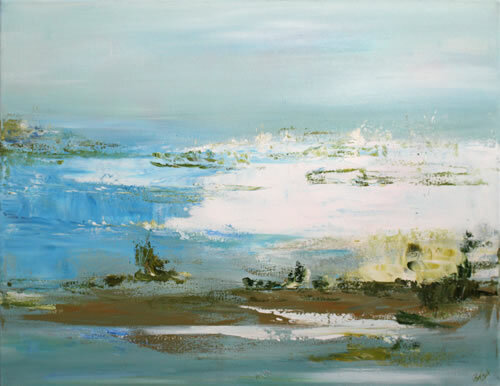 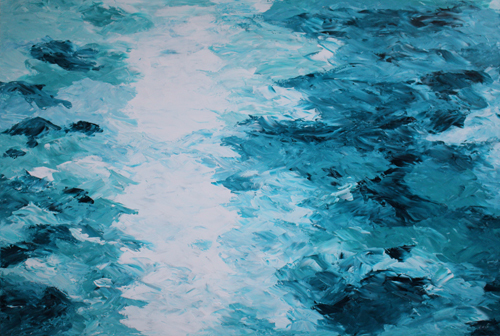 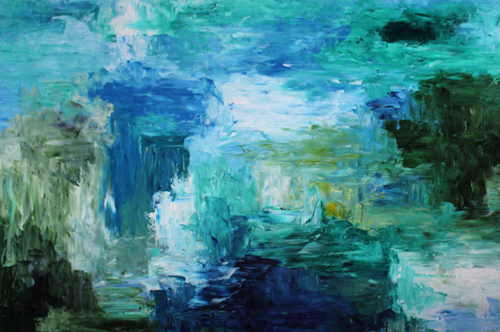 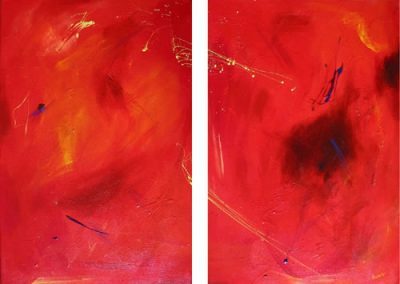 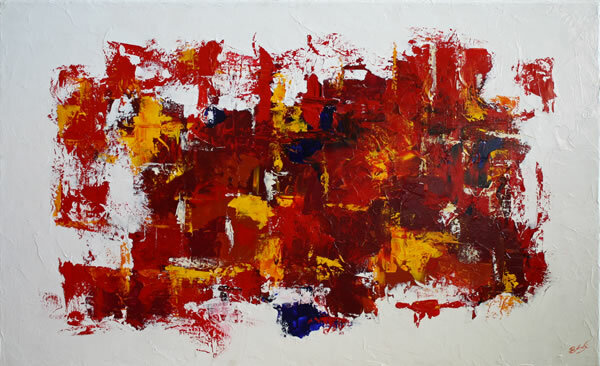 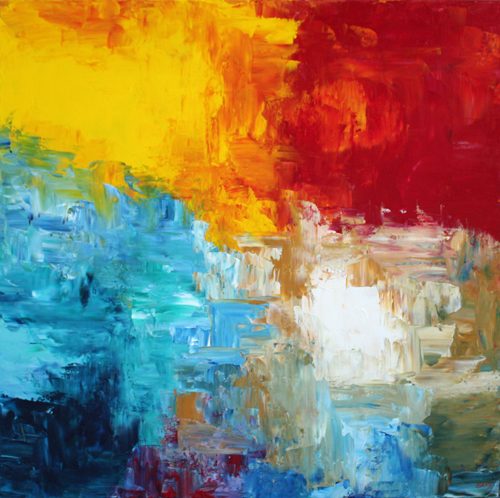 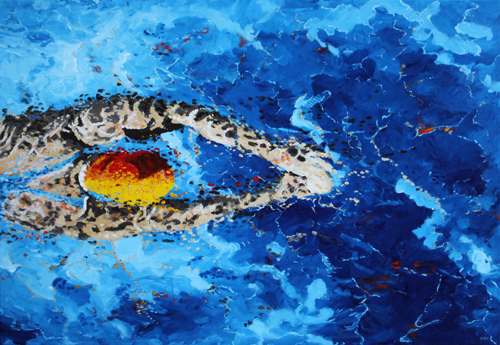 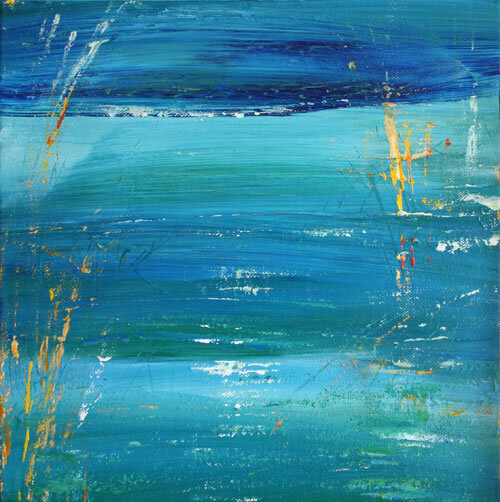 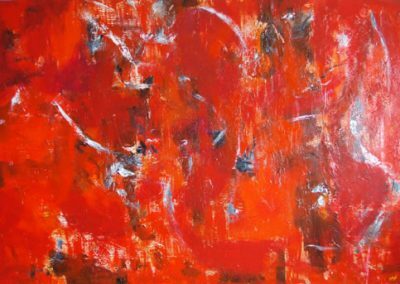 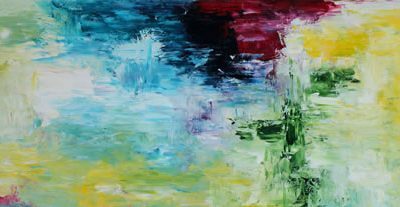 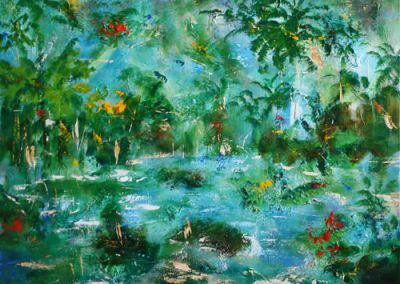 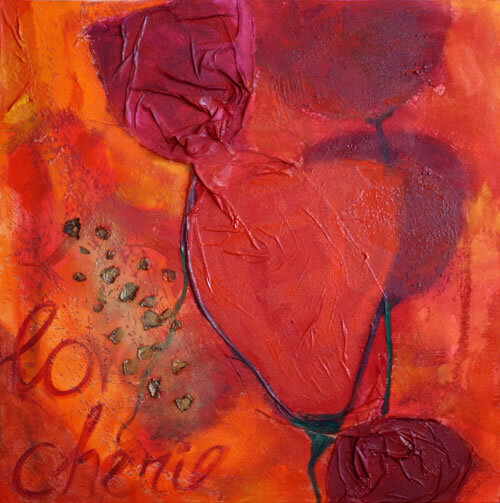 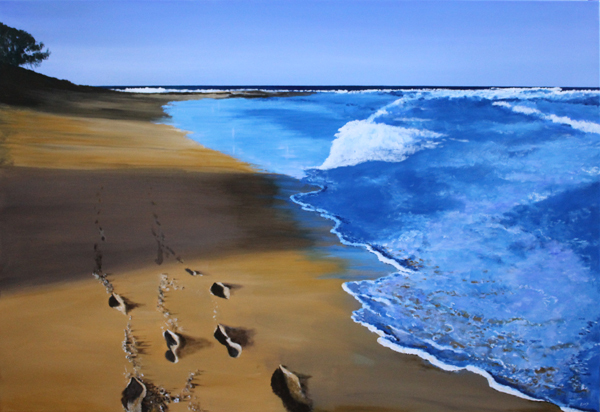 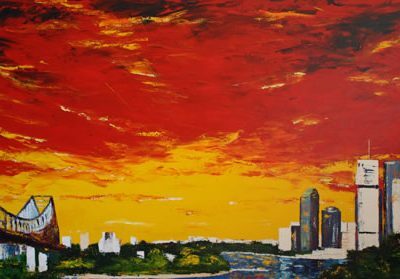 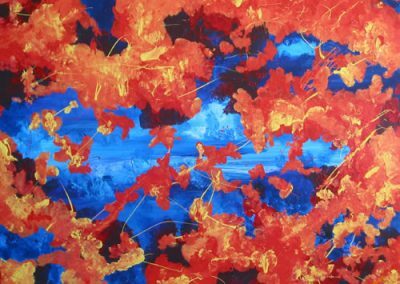 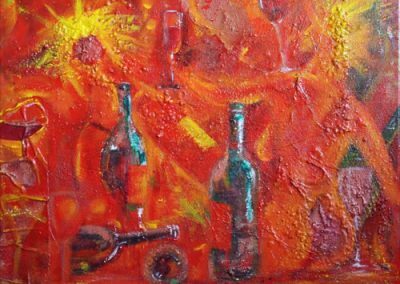 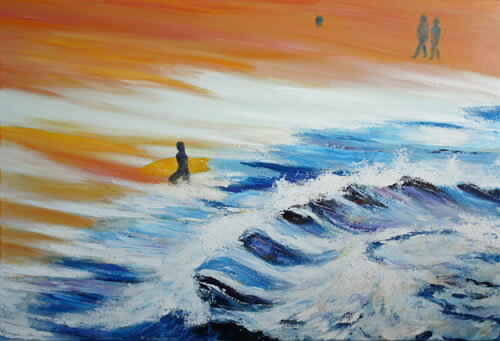 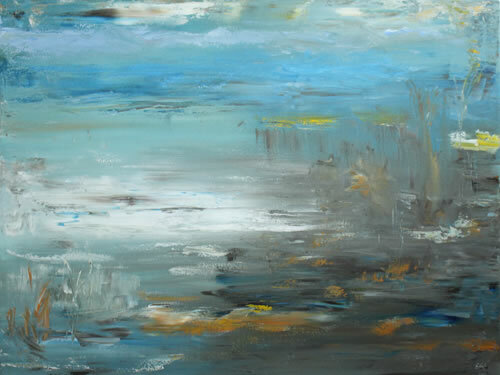 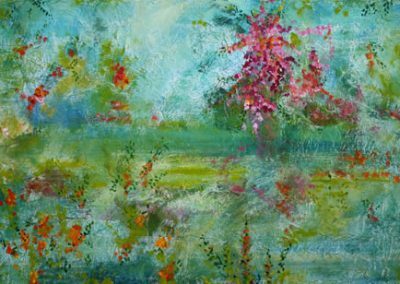 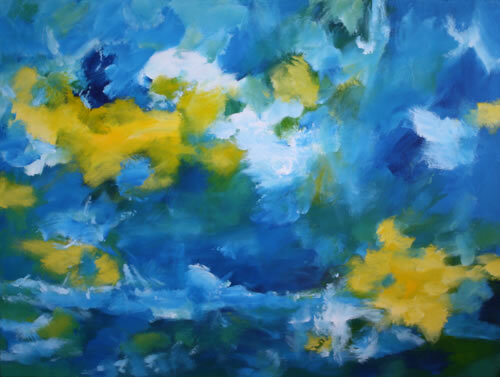 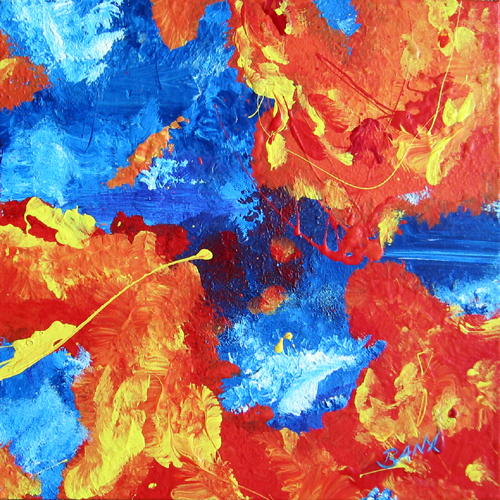 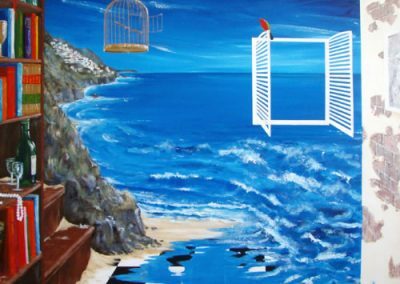 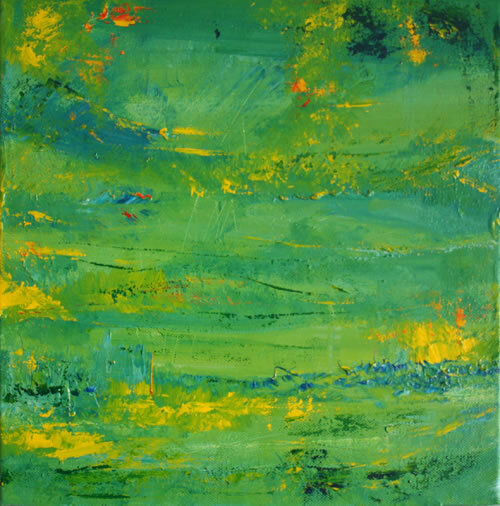 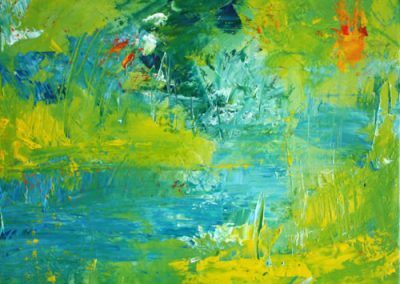 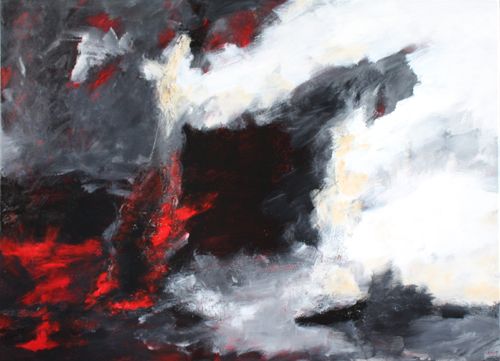 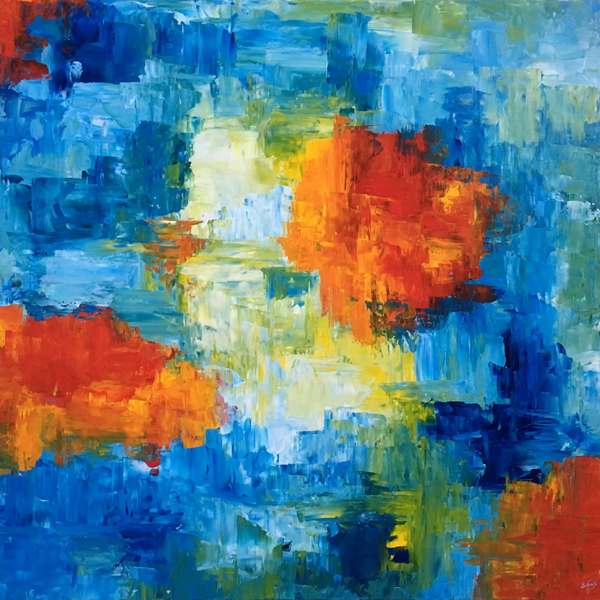 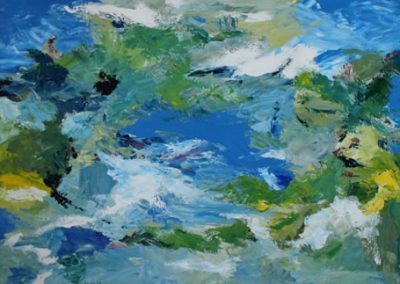 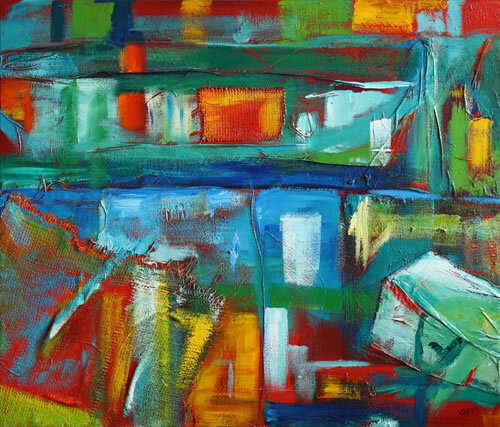 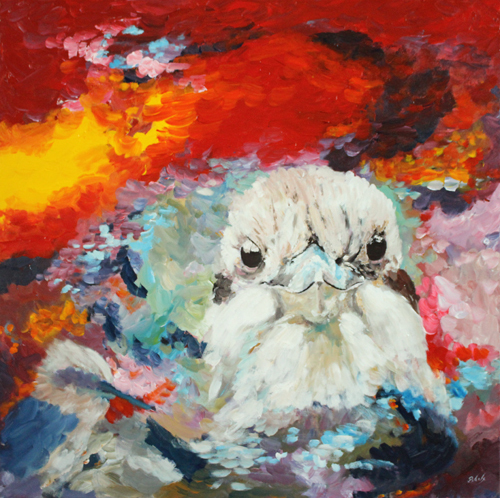 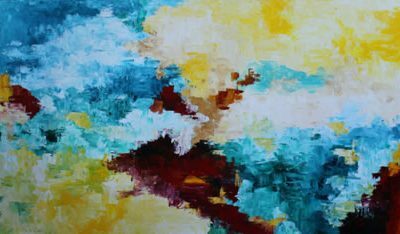 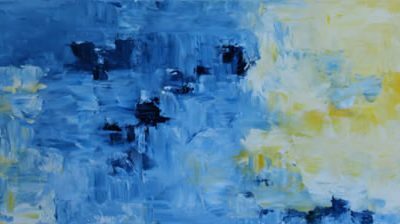 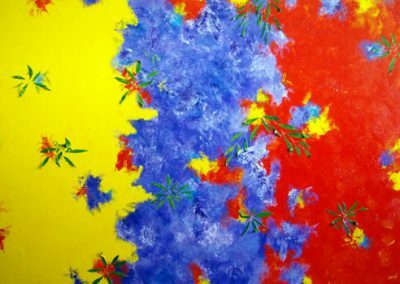 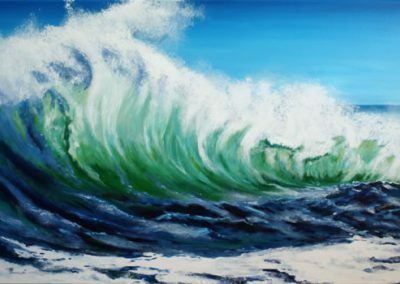 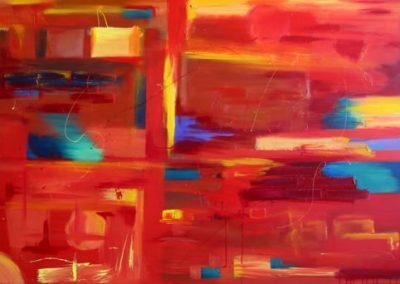 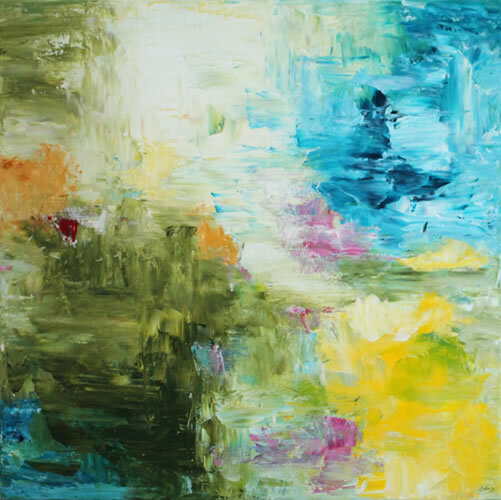 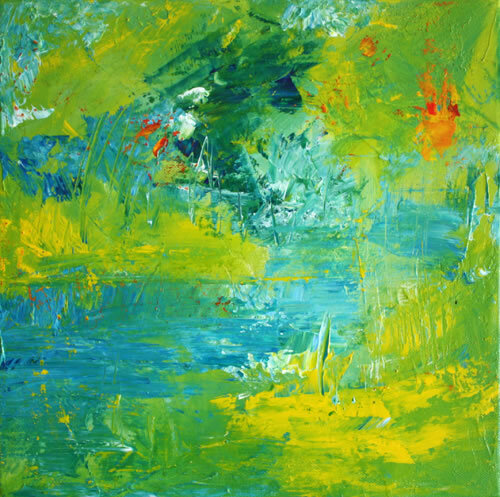 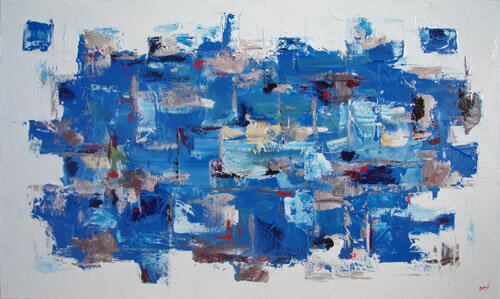 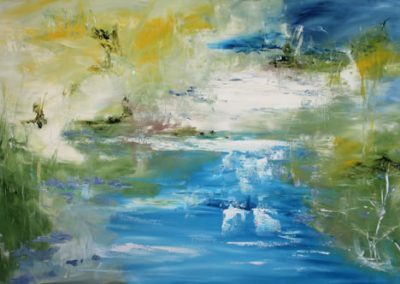 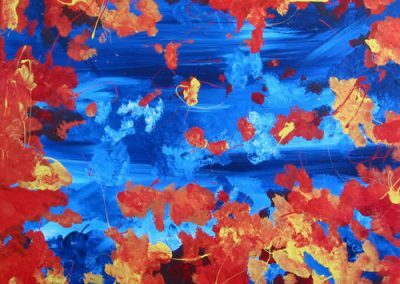 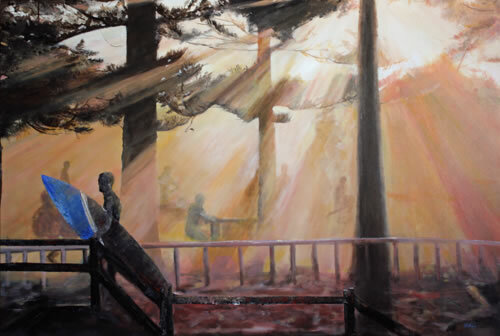 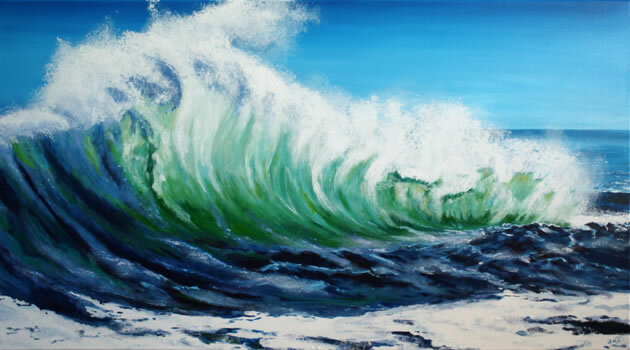 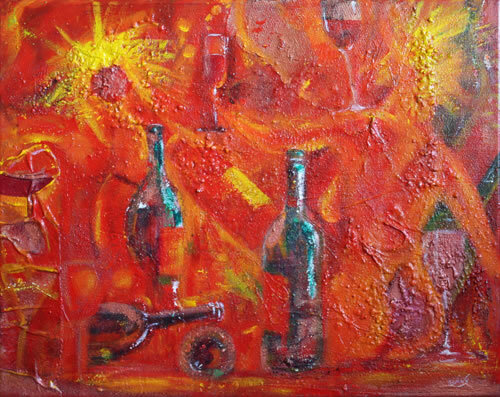 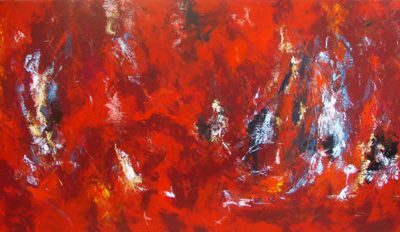 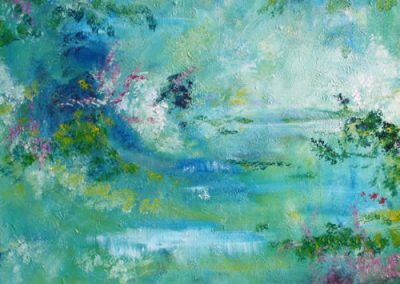 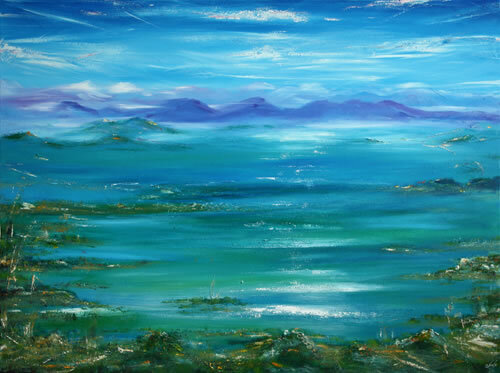 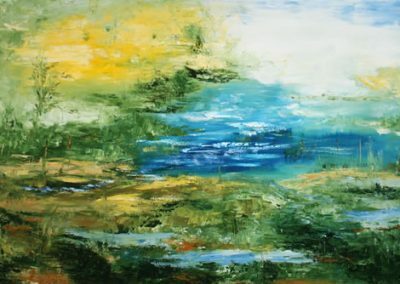 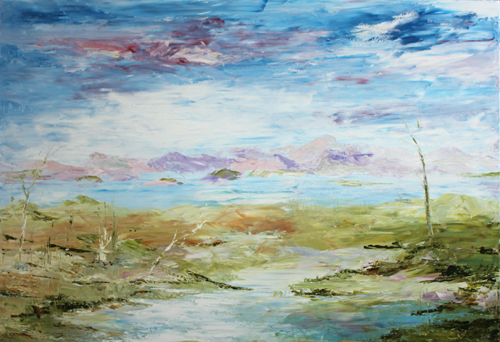 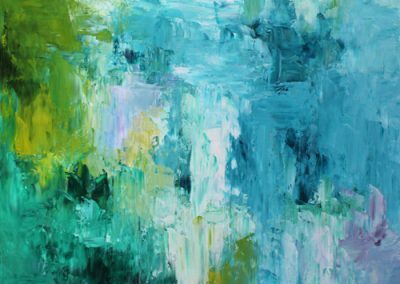 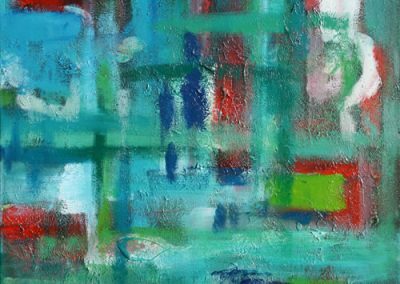 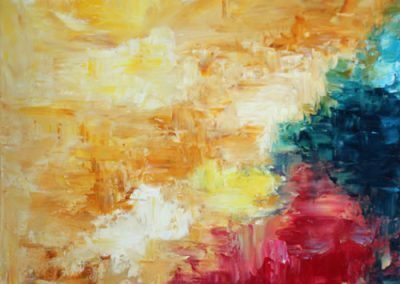 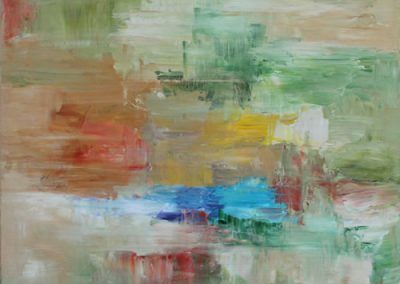 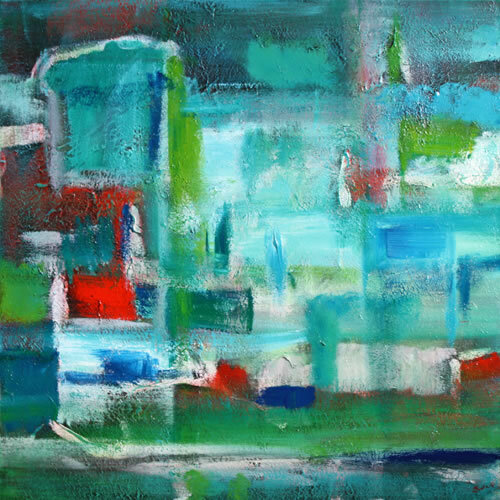 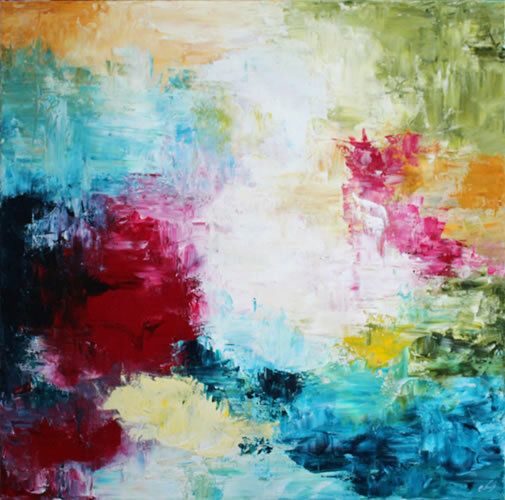 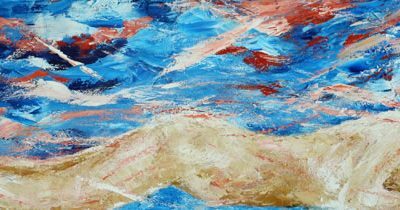 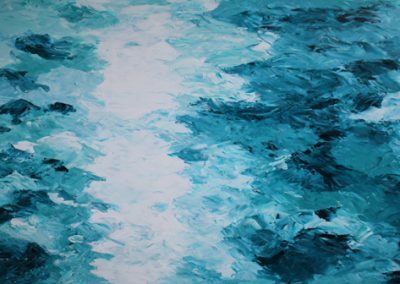 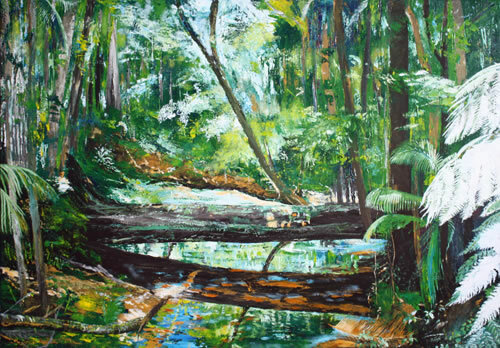 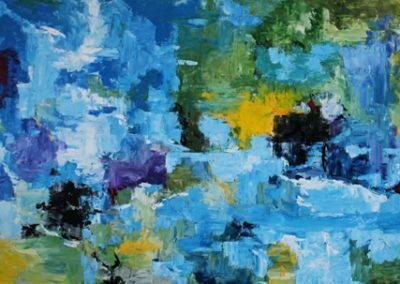 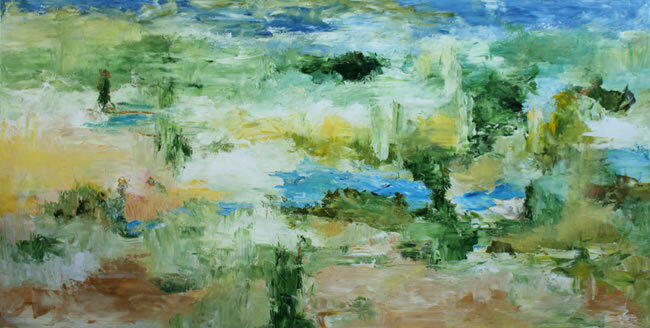 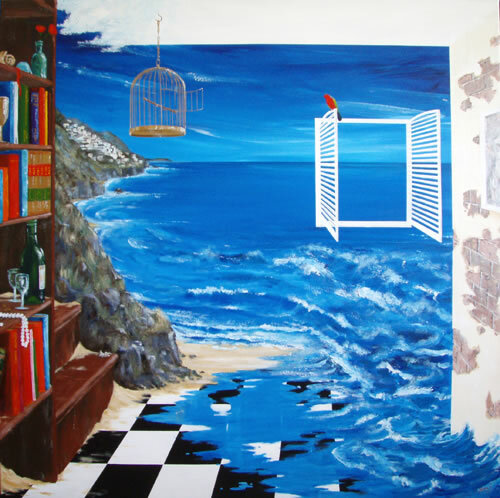 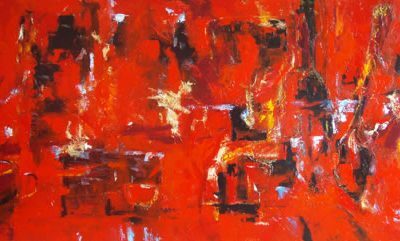 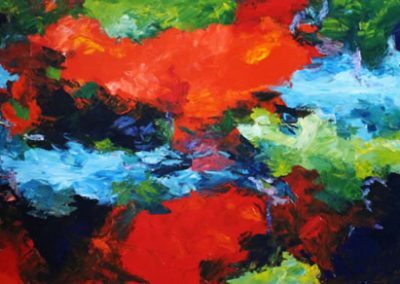 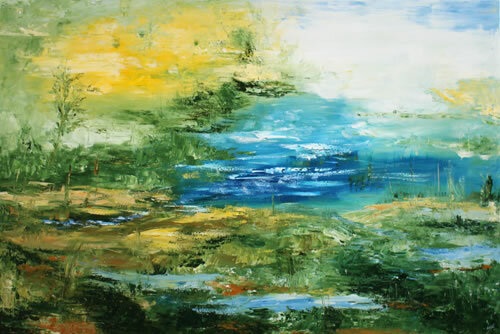 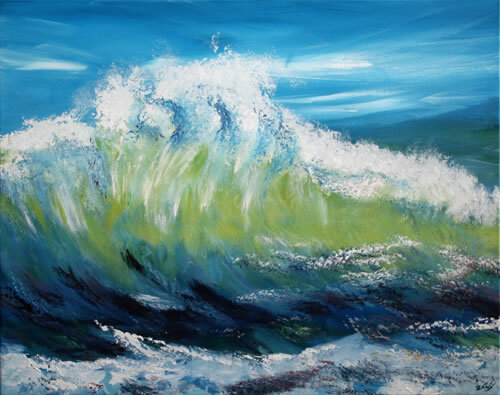 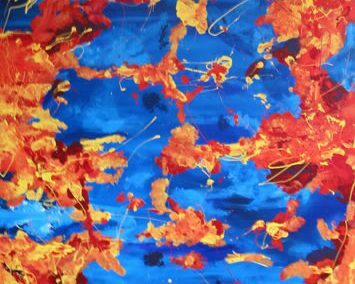 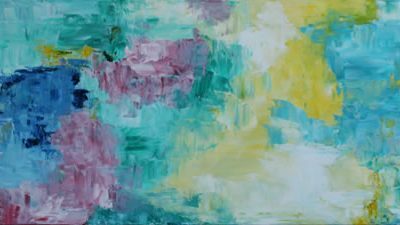 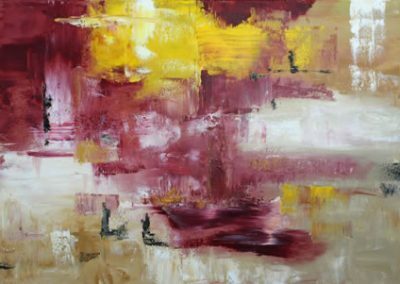 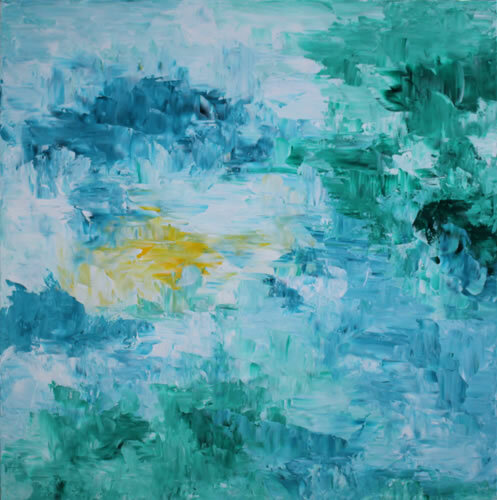 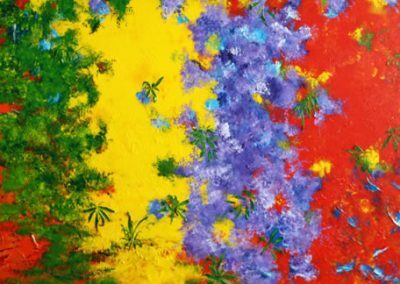 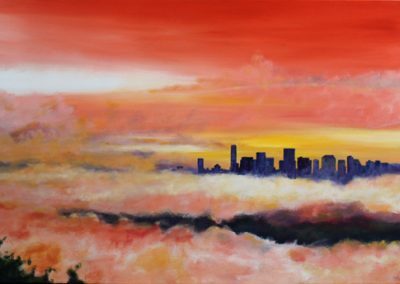 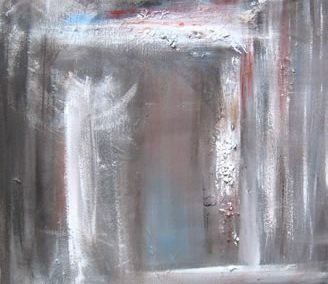 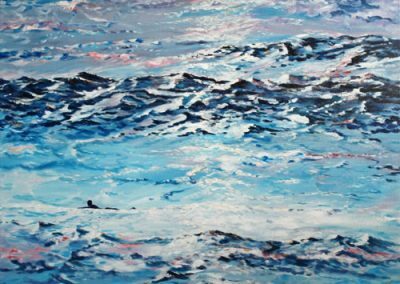 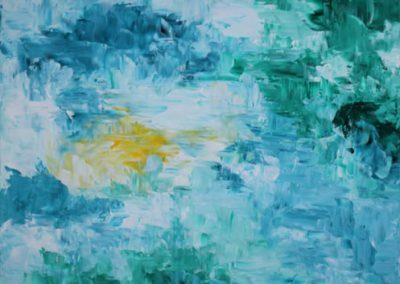 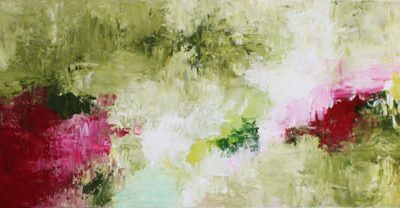 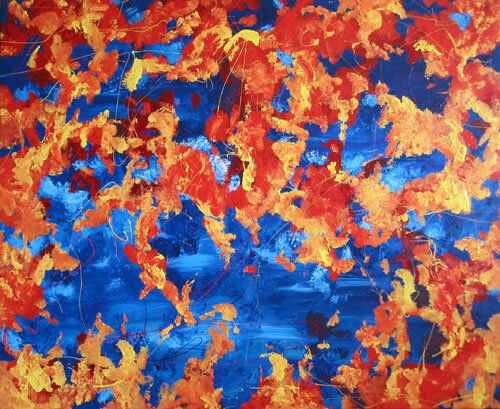 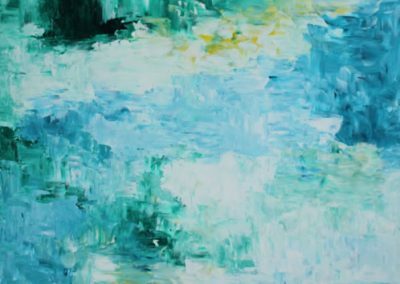 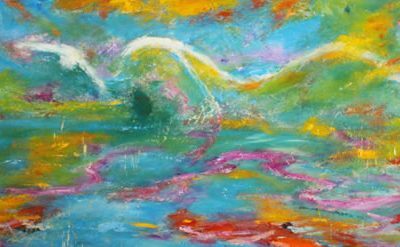 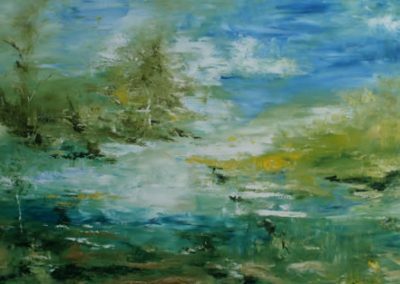 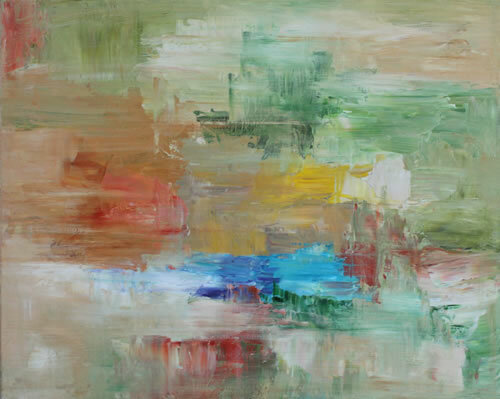 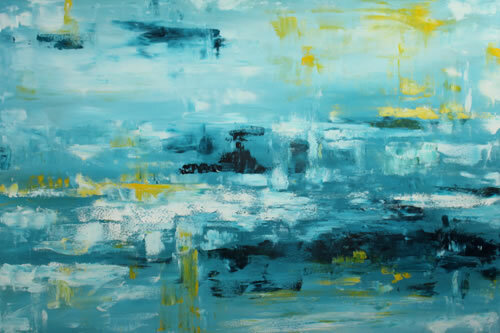 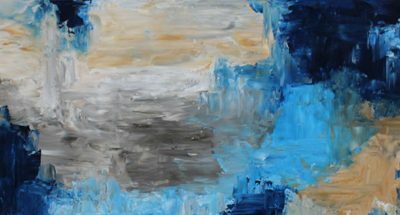 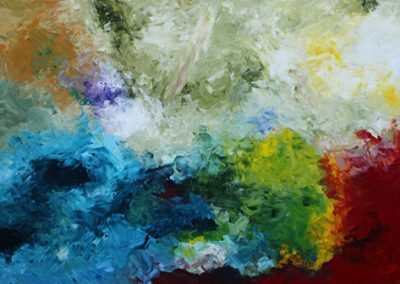 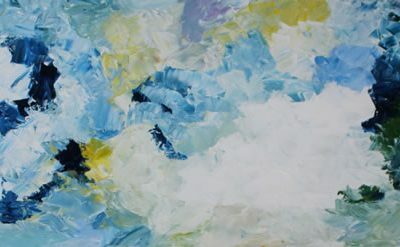 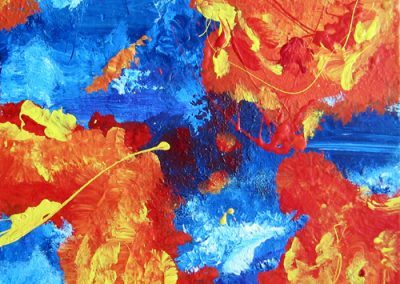 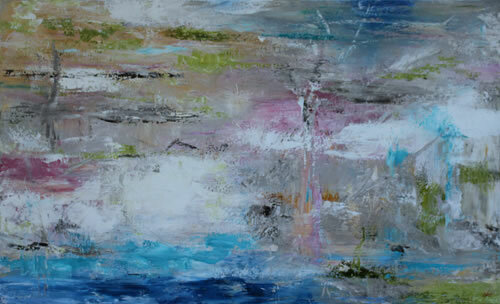 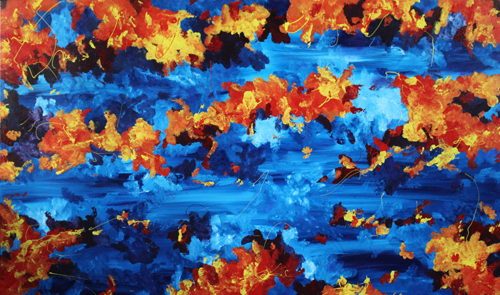 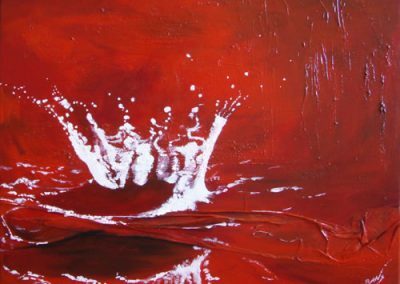 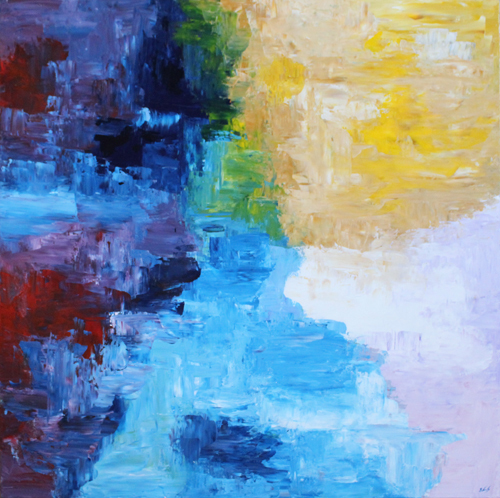 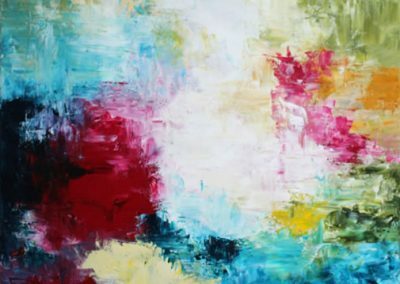 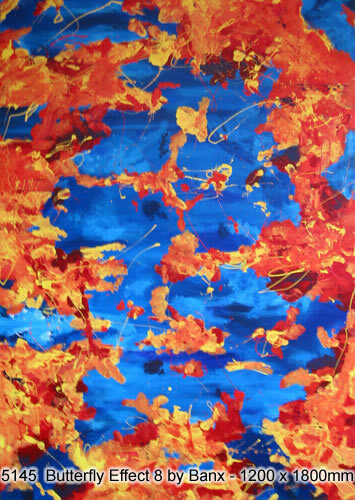 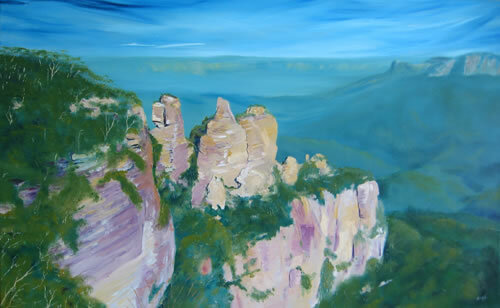 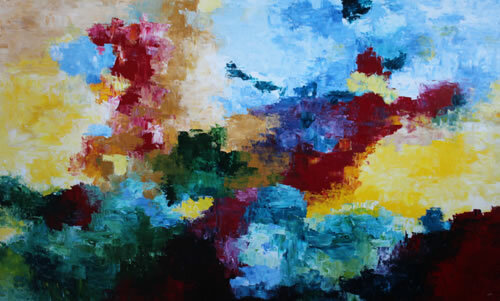 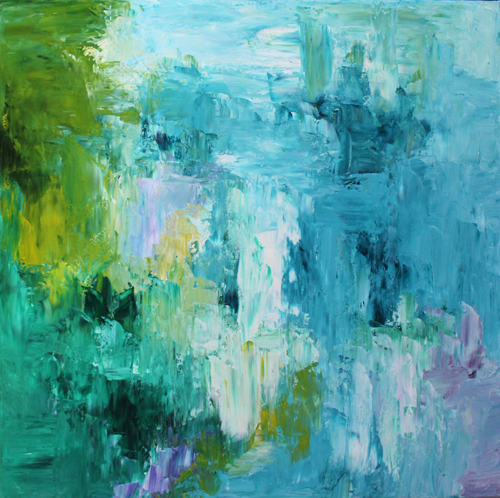 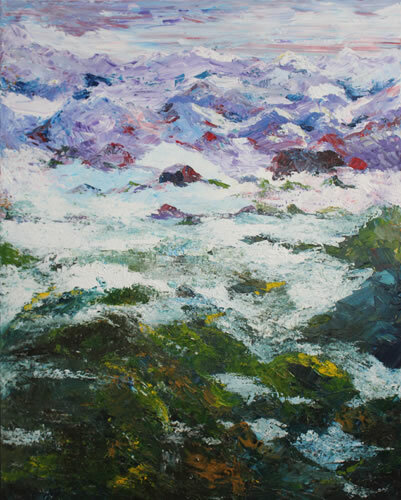 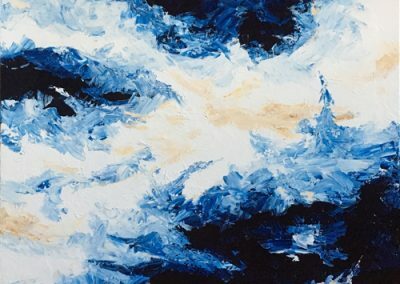 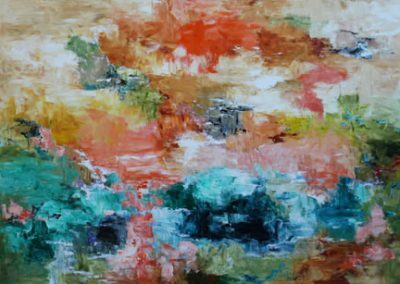 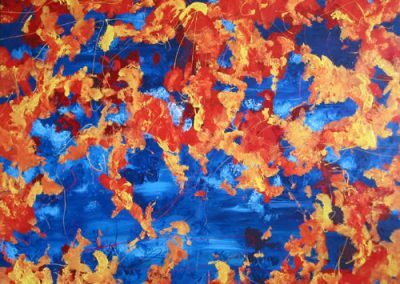 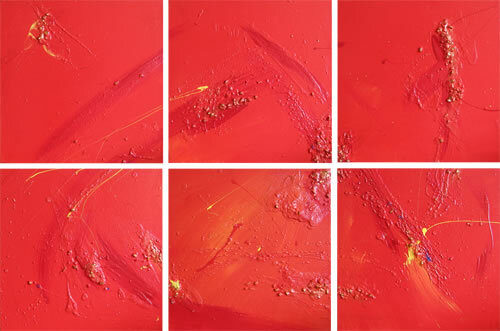 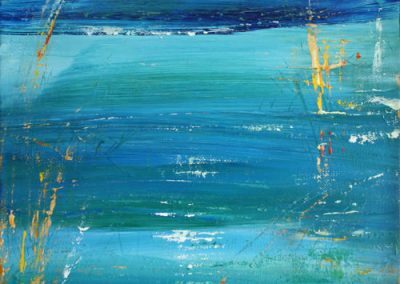 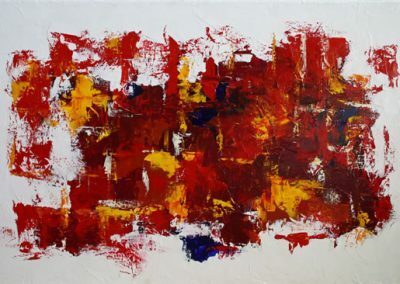 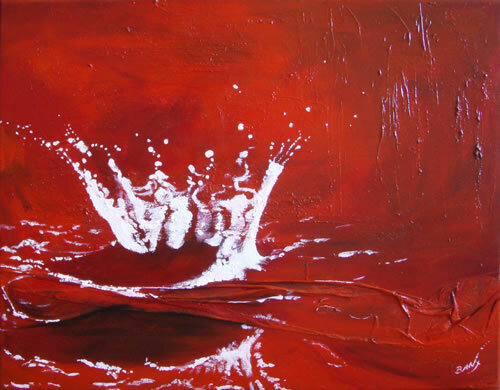 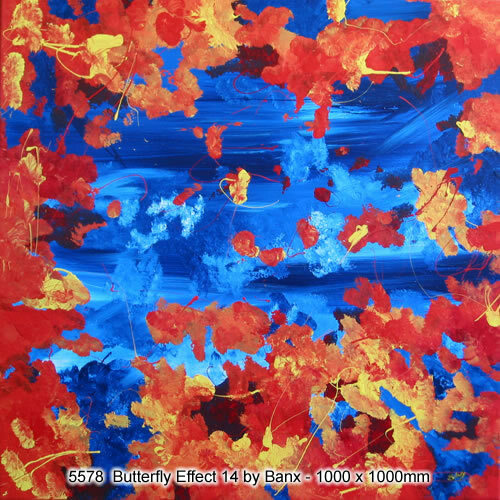 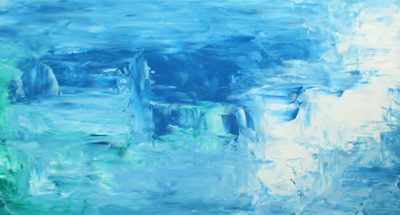 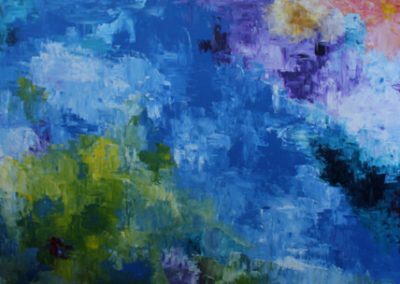 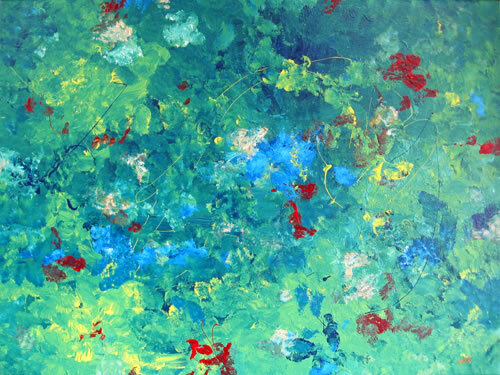 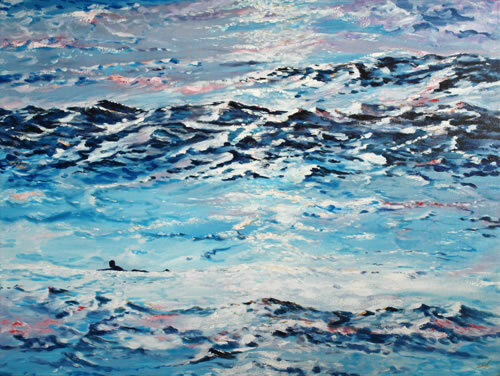 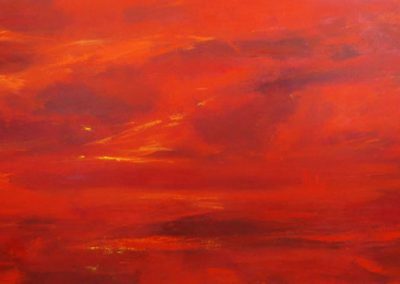 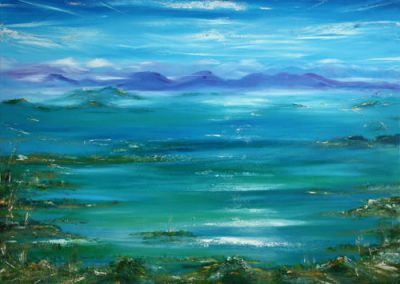 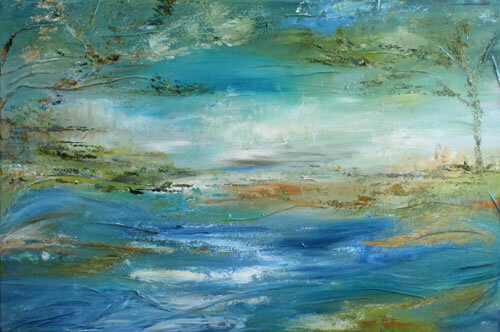 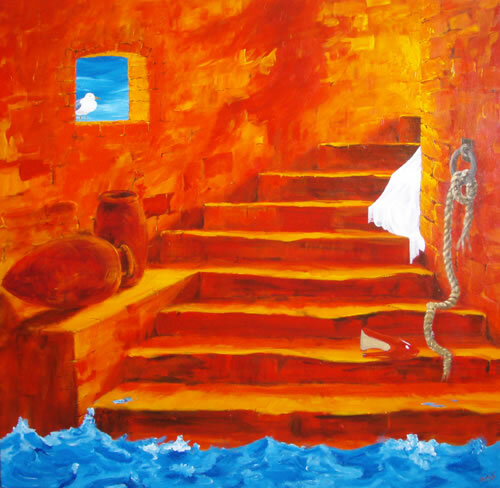 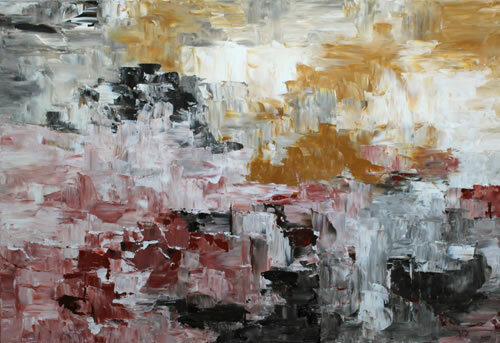 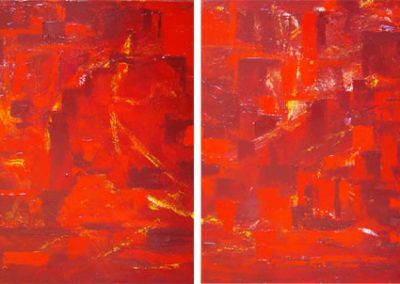 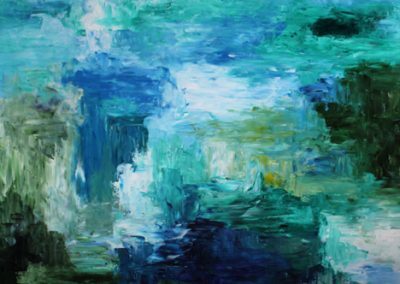 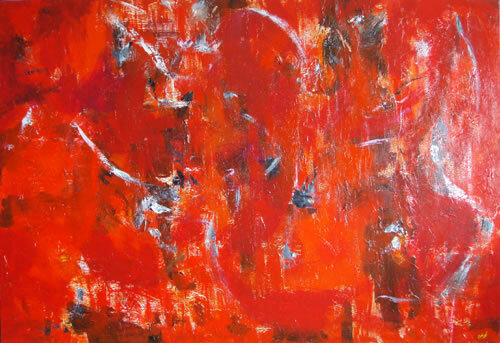 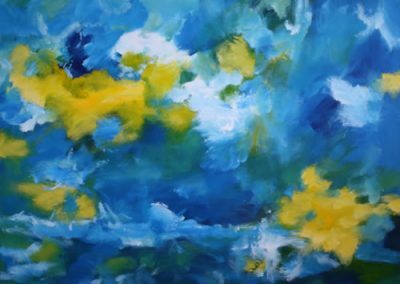 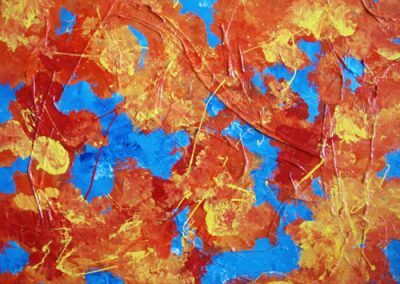 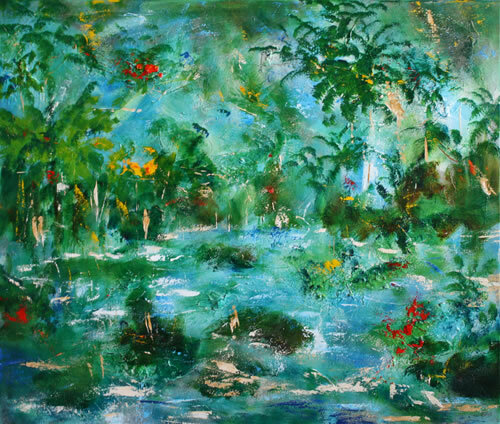 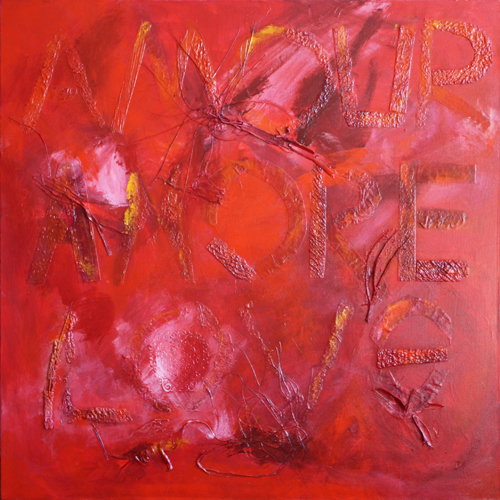 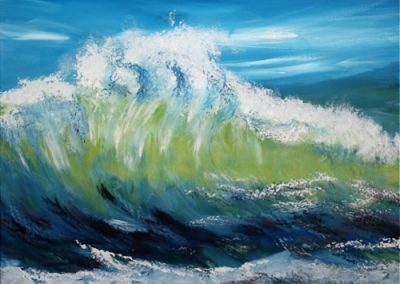 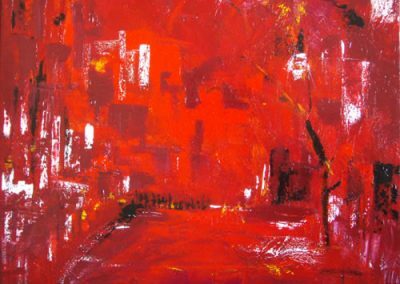 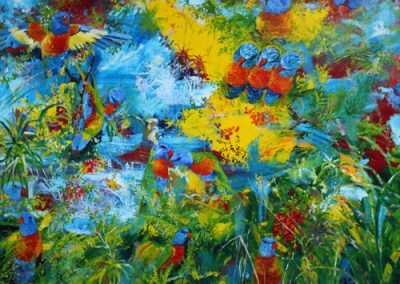 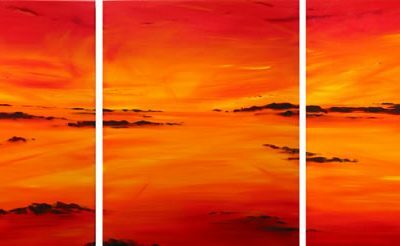 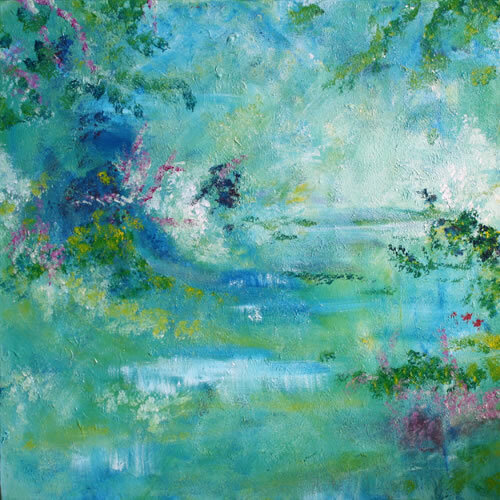 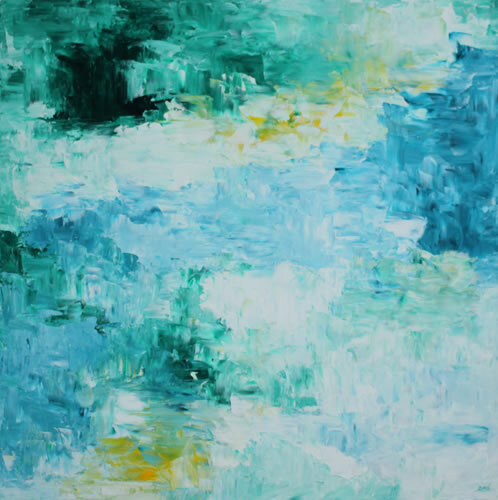 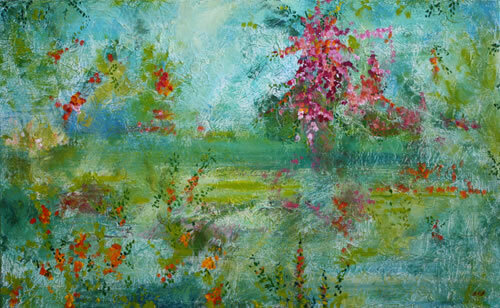 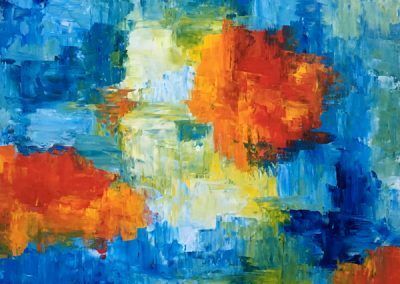 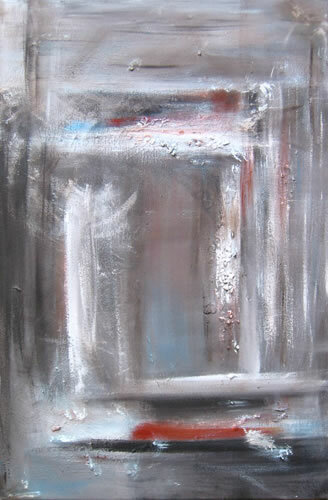 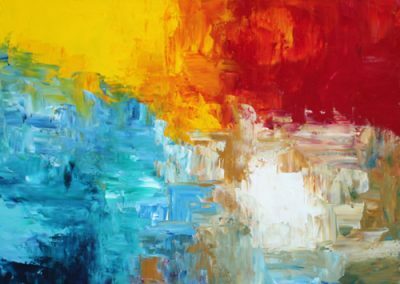 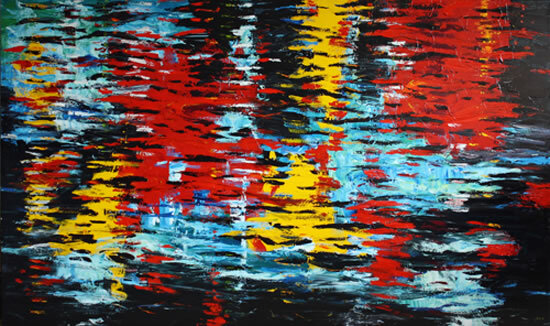 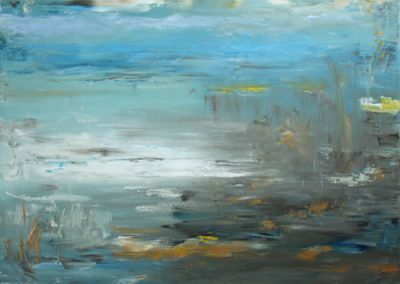 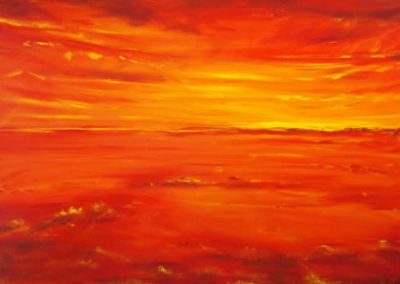 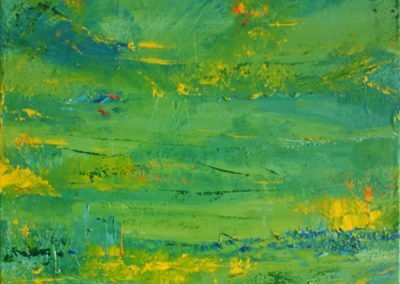 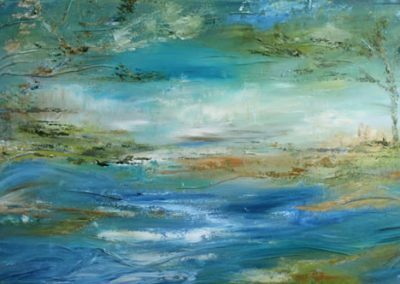 Carol is a free flowing emotive and intuitive painter with a dynamic sense of colour. 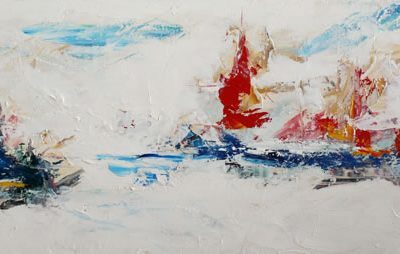 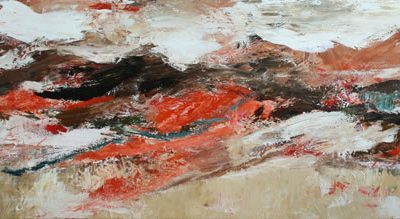 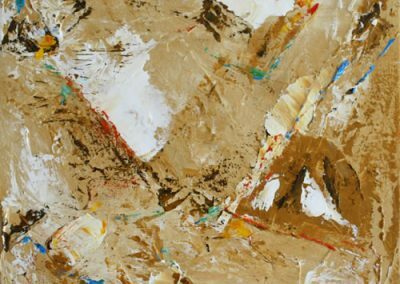 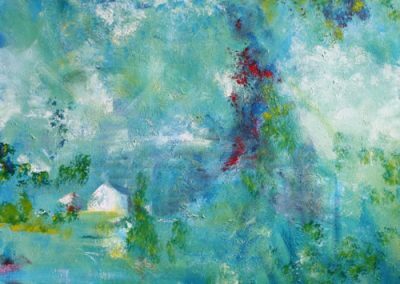 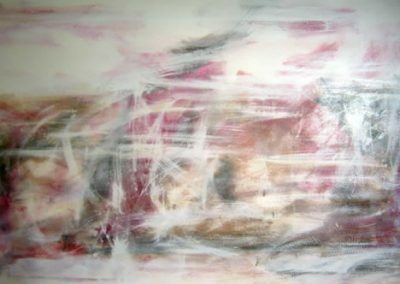 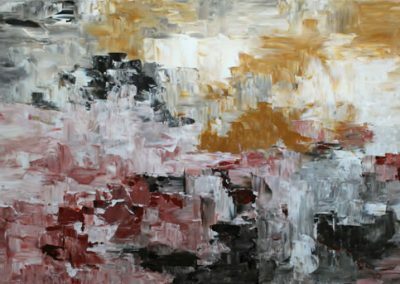 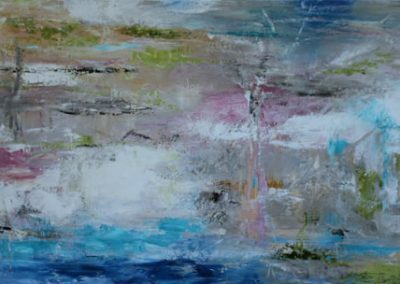 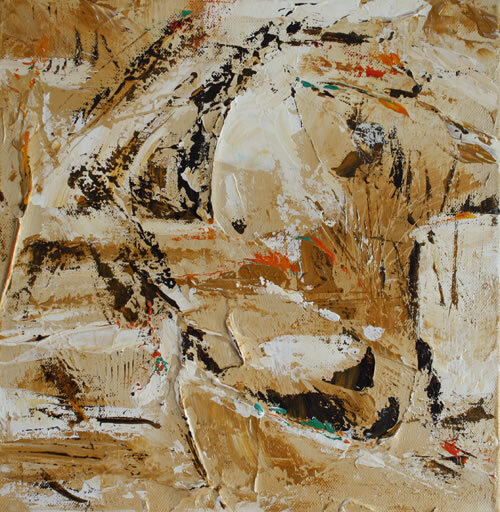 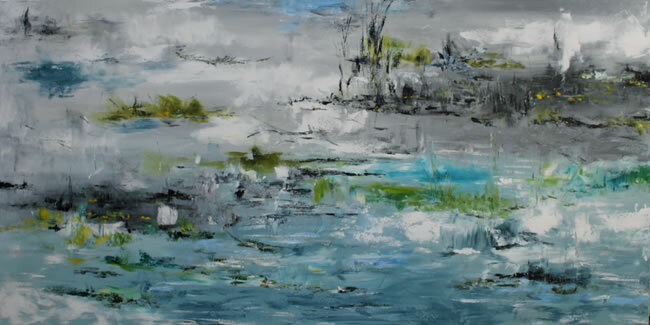 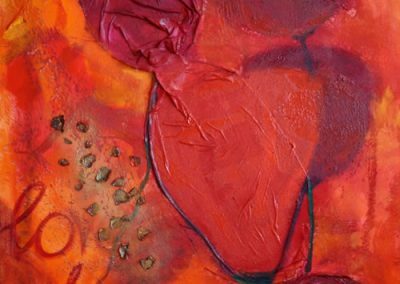 Carol finds expression through the texture and application of the paint and draws inspiration from the natural environment, seeking always to break free of constraint. 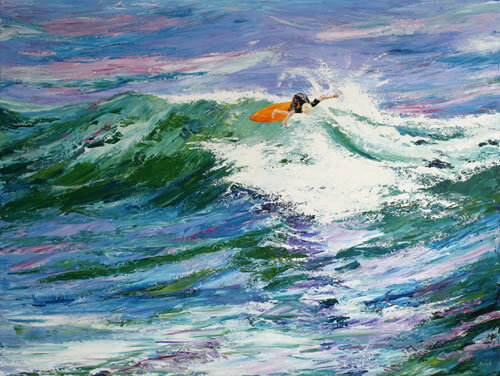 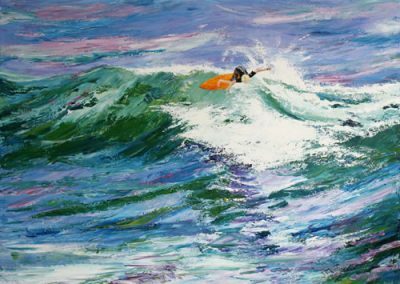 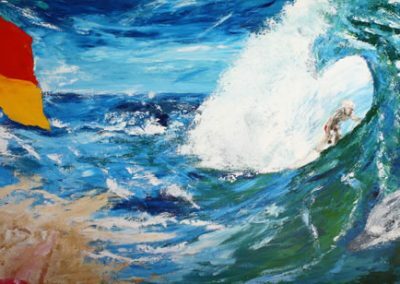 Ronzo prefers to work in oils, pastels and other mixed textures, he likes to set a colourful and contrasting mood for the viewer to feel a way into; acquires his inspiration from his family, friends and artists such as Tom Roberts, Dali, Eric Clapton, Helmut Newton, Brett Whiteley… and of course, as evidenced in his artworks: the surf and its riders, particularly in and around Queensland coasts and islands. 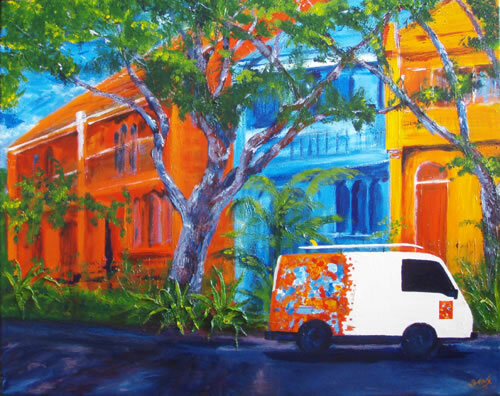 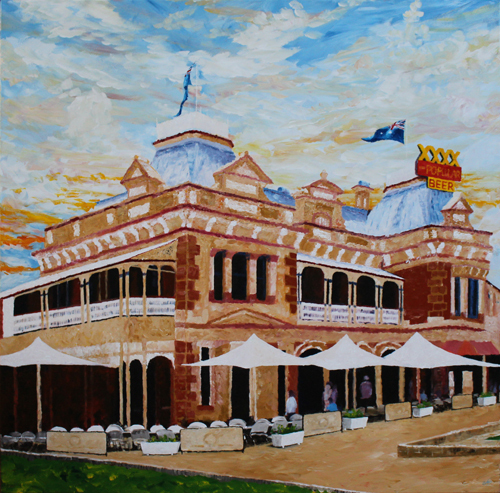 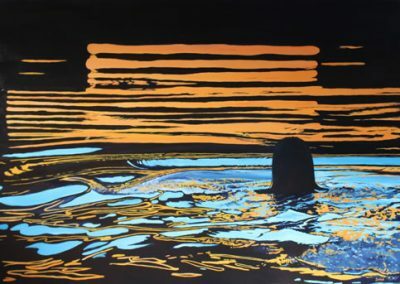 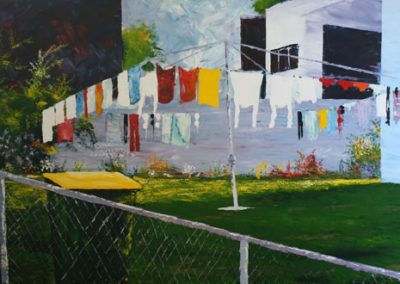 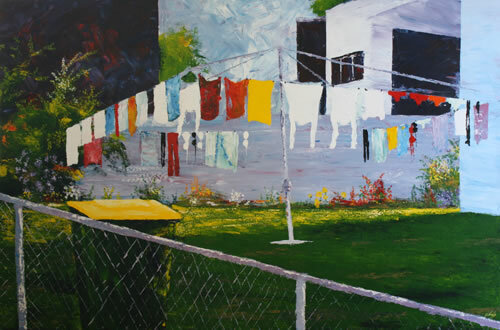 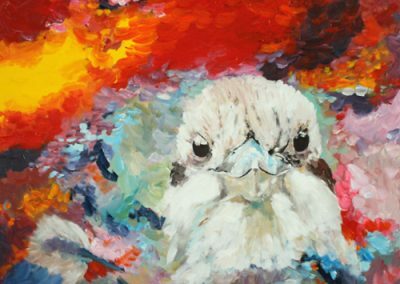 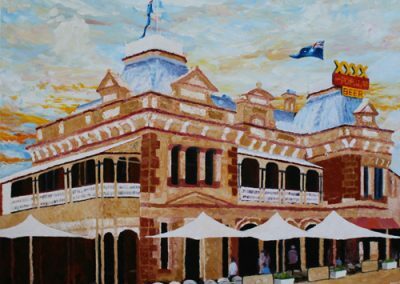 Maryika is an award-winning Queensland based artist who was born and raised in country Victoria, now living in Toowoomba on the Darling Downs Queensland. 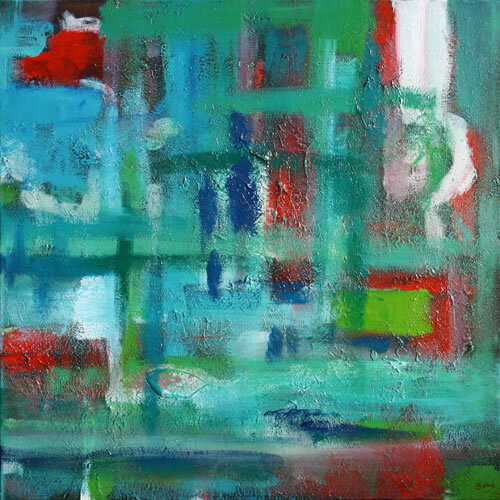 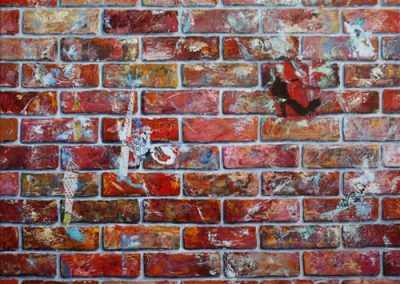 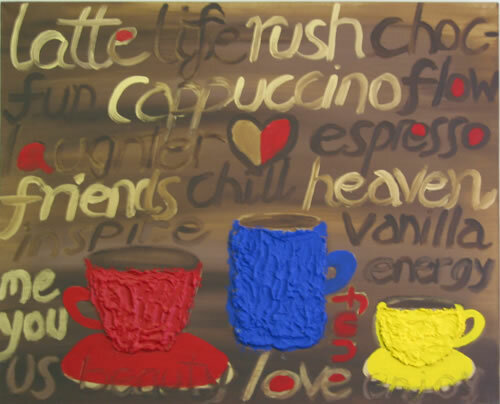 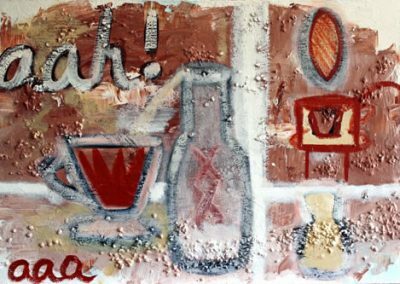 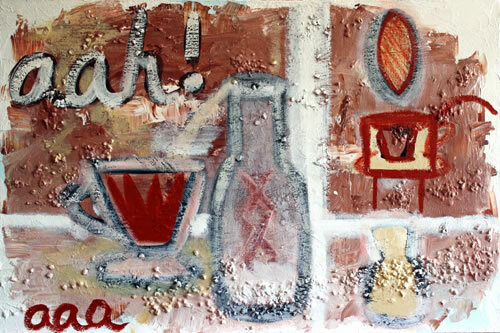 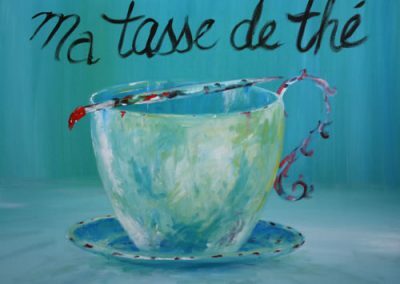 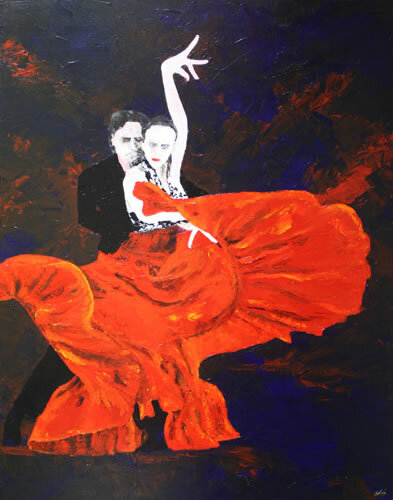 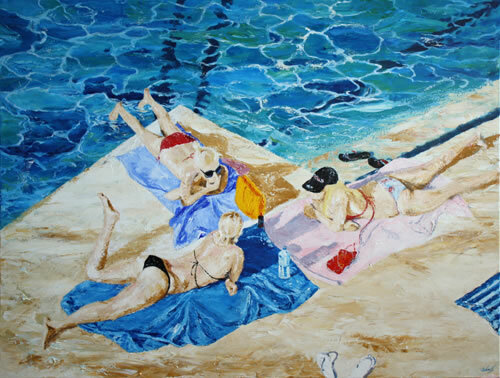 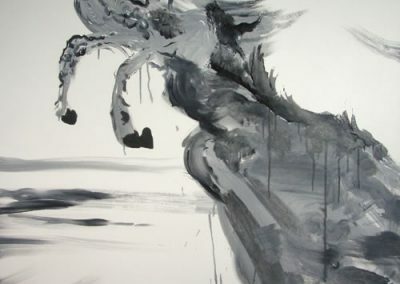 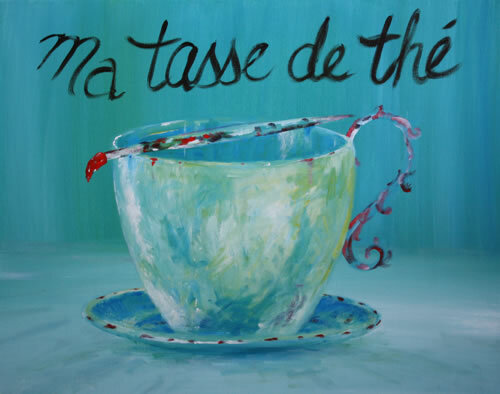 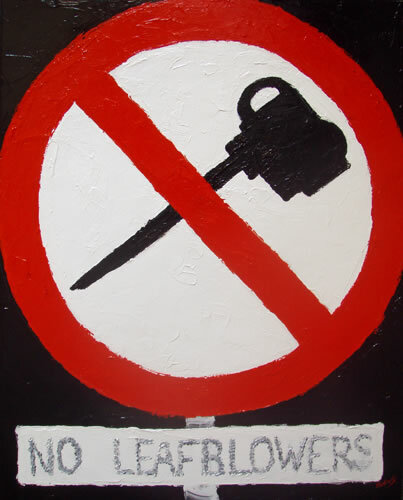 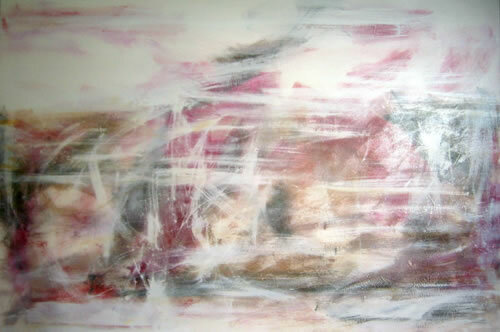 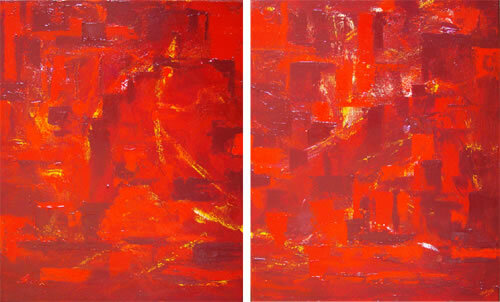 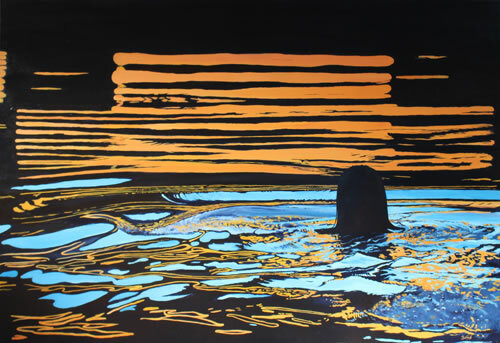 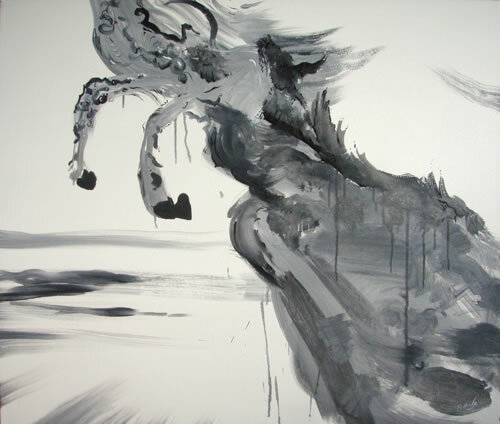 At present she tutors and paints mainly with mixed mediums and has an interest in colour, design and printmaking. 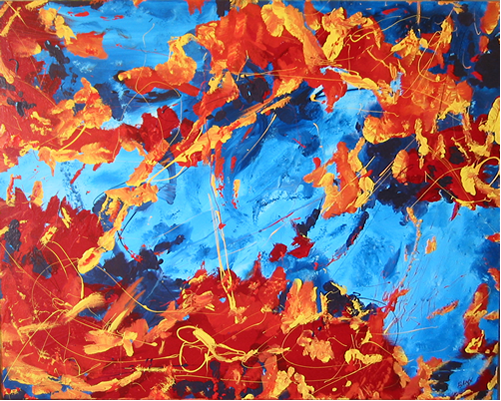 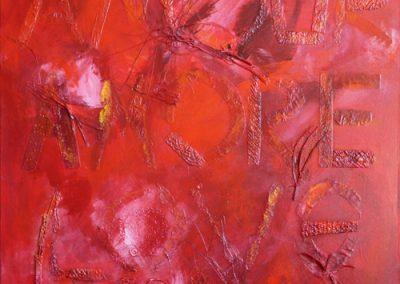 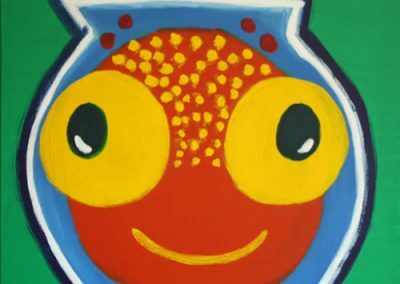 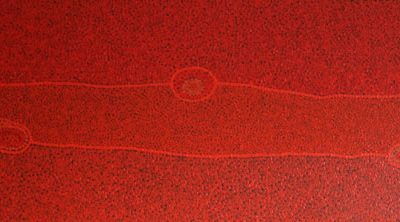 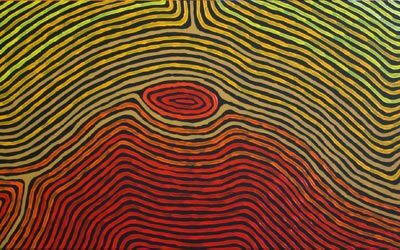 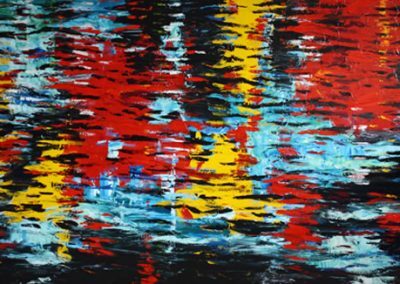 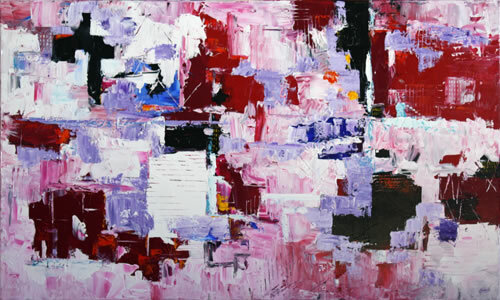 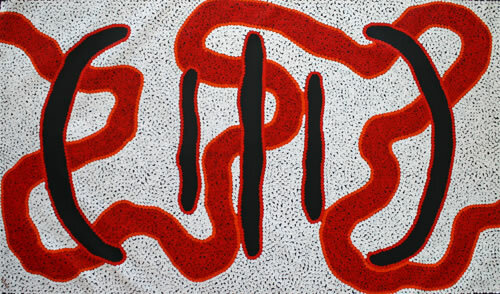 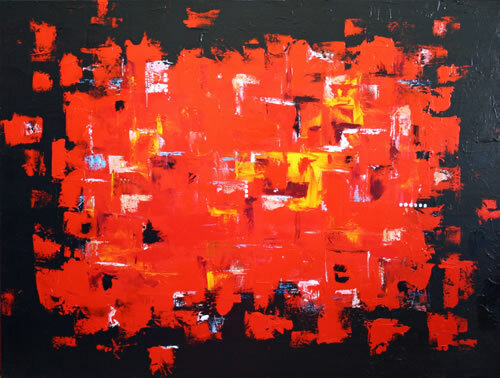 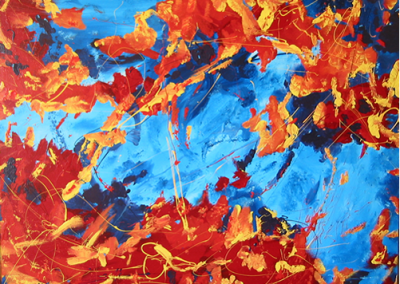 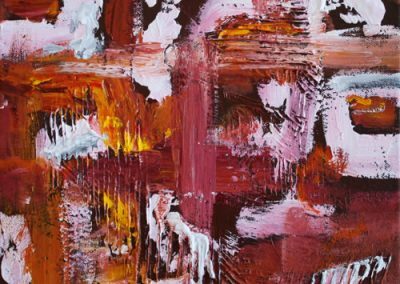 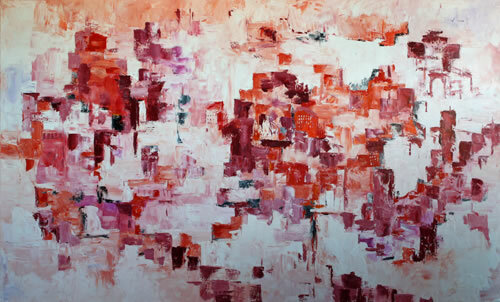 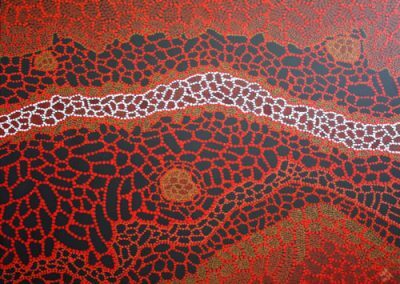 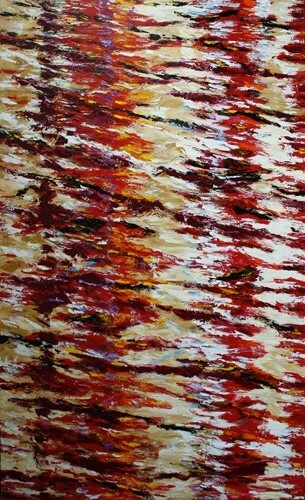 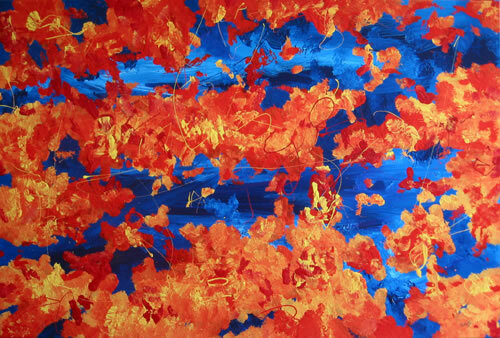 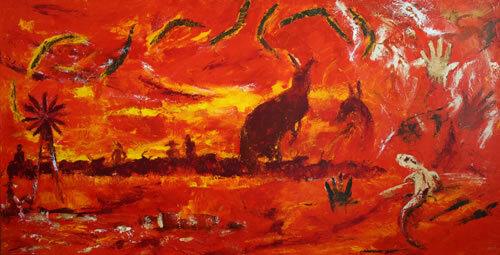 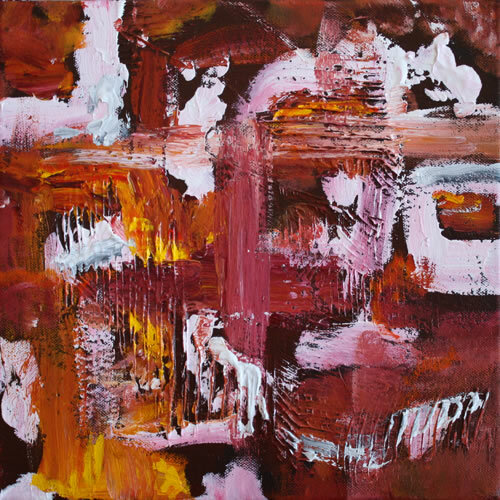 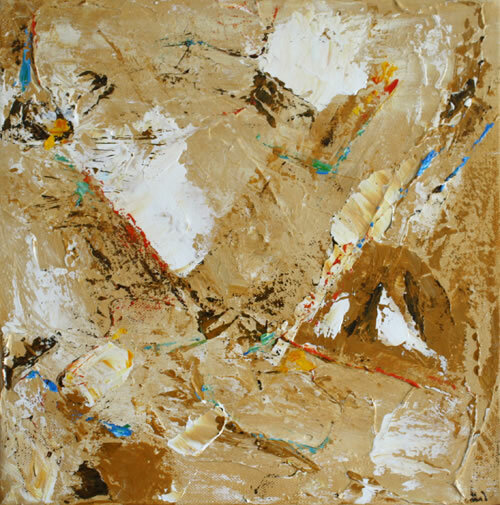 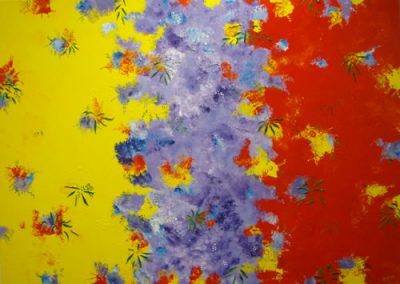 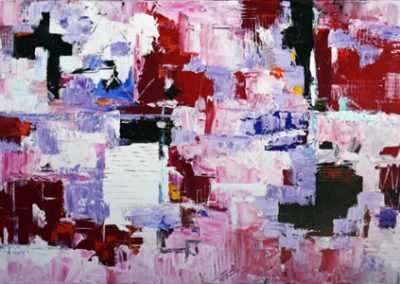 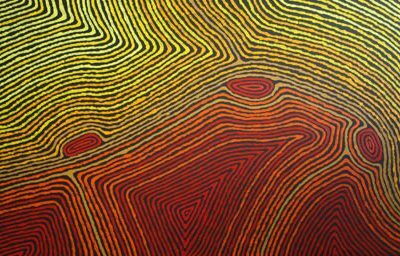 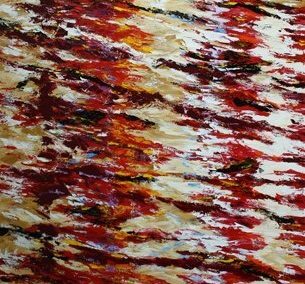 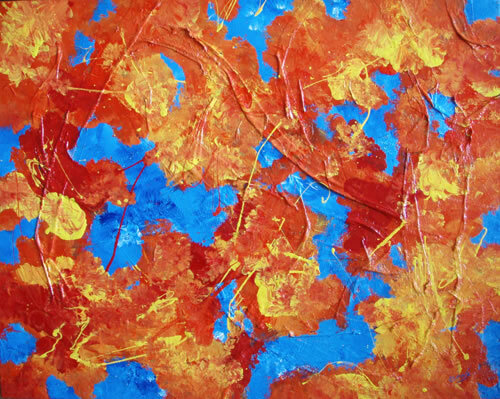 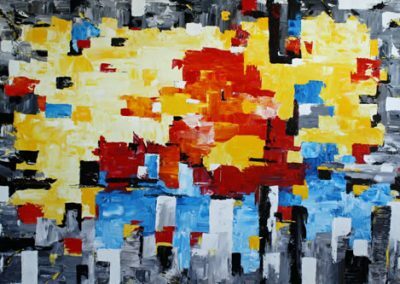 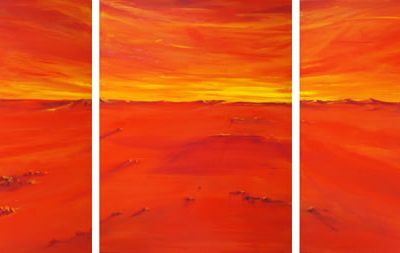 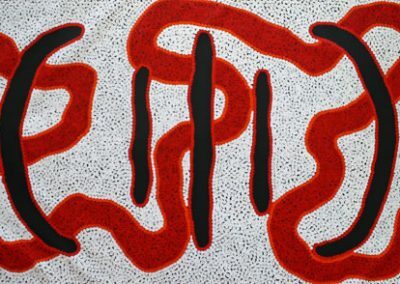 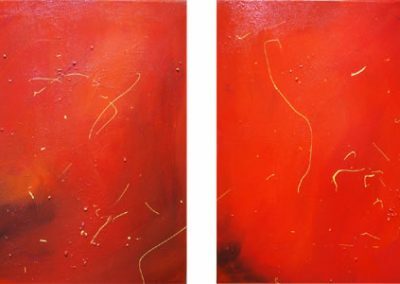 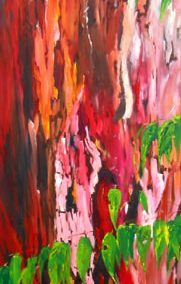 “Woonga”, like his brother Tio, sees his intensely colourful work as a development of contemporary Aboriginal abstract. 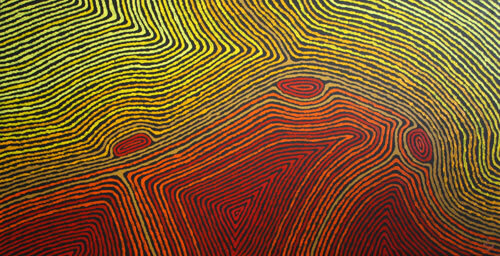 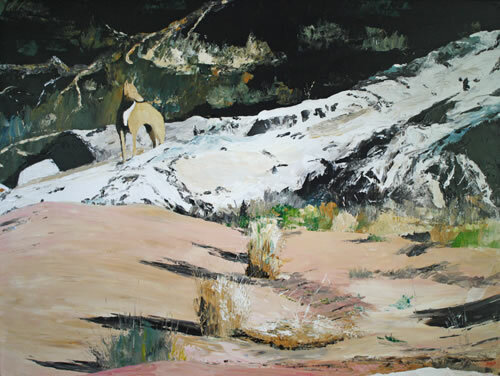 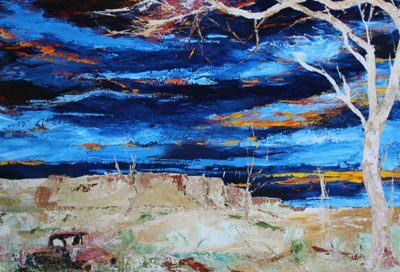 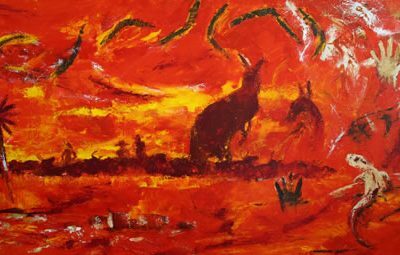 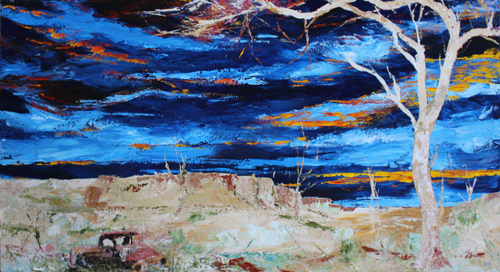 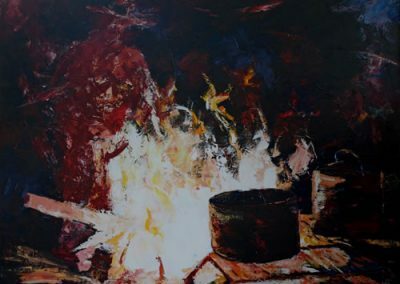 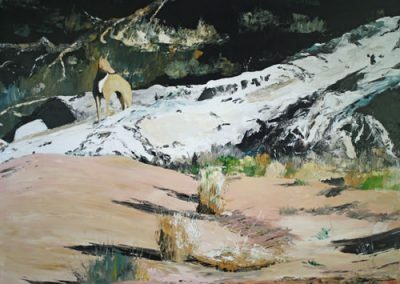 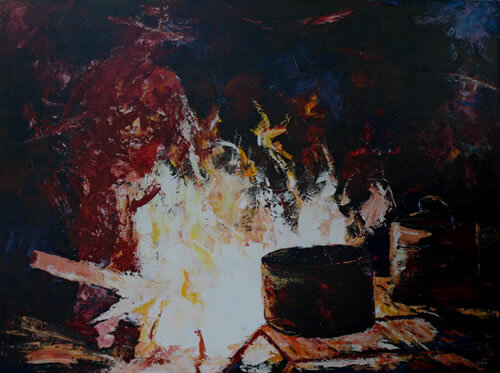 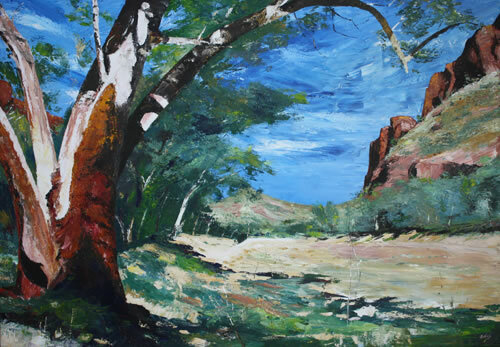 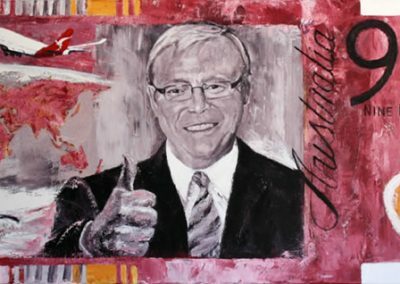 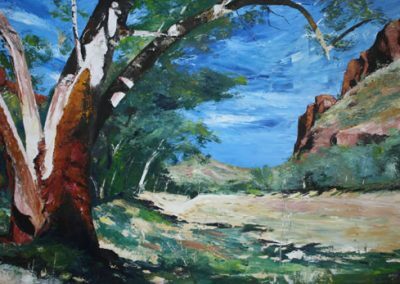 His paintings represent the indigenous bush camp on a dry river bed; with people lying on the dry river bed and wind breaks at either end protecting them.